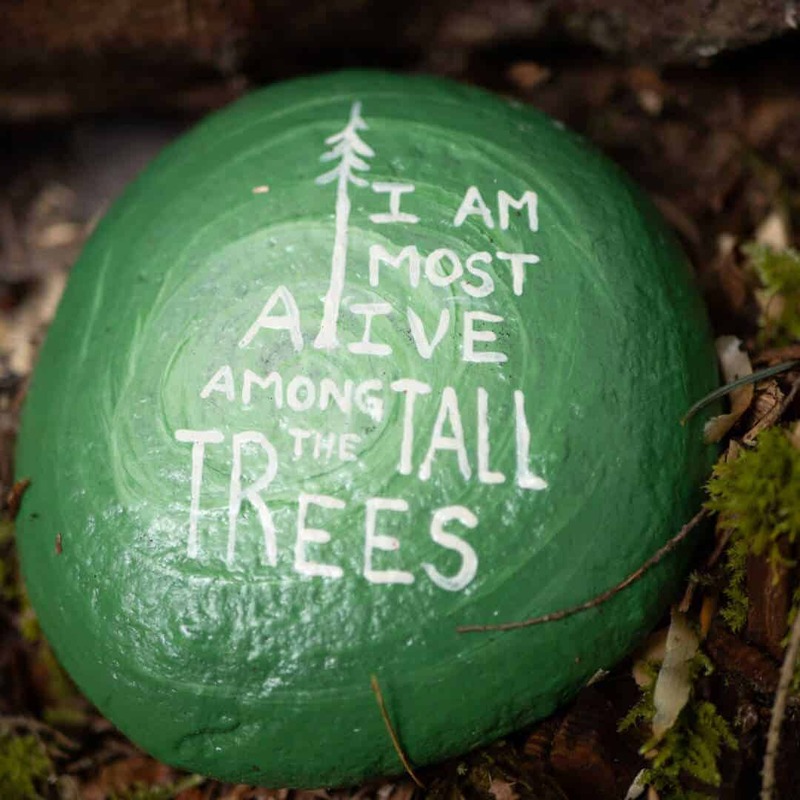 …says treehouse builder, Pete Nelson. His show, Treehouse Masters, has popularized treehouse “glamping” for kidults. 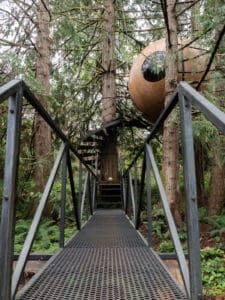 I visited the Nelson Treehouse Company’s Bed and Breakfast, Treehouse Point, along with a couple of other in-the-tree locations (Free Spirit Spheres, the Forest House and — at least in spirit — the treehouse at Doe Bay) in the Pacific Northwest. 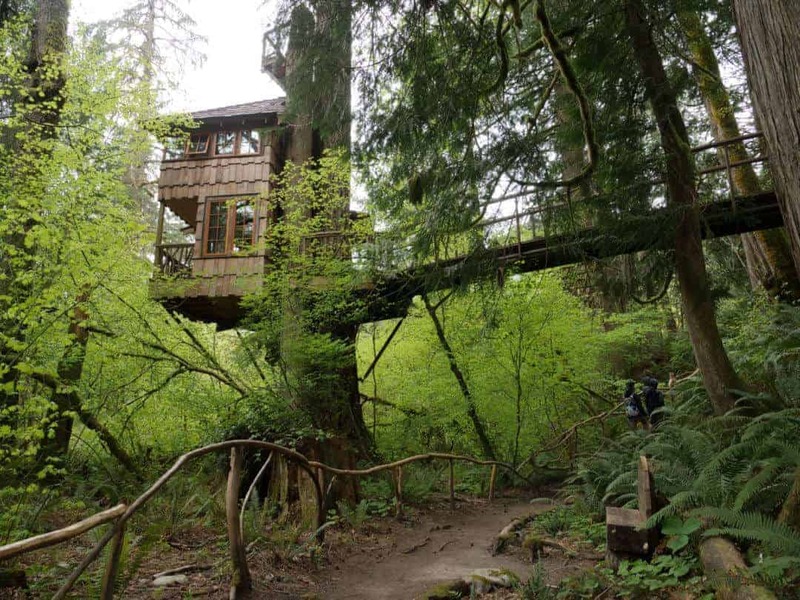 Here’s a lowdown on getting high (up in the trees at least) along with a listing of other treehouses in the PNW that you can rent, including treehouse rentals Washington and treehouse rentals Oregon. 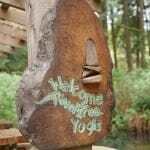 If you’re interested in Treehouse Point this documentary chronicles Pete Nelson’s efforts to build Treehouse Point. Pete Nelson’s own book about the basics of treehouse construction. A fun book to look at even if you don’t aspire to build your own treehouse. There is something about being in the trees. Perhaps it appeals to our primal nature, or a desire to revisit childhood. I have memories of summers spent climbing trees, trying (unsuccessfully) to collect junk and boards around the neighborhood to build a tree fort, playing pirate – and sometimes falling and skinning a knee. My tree-climbing days may be over but, fortunately, I now don’t have to risk falling or skinning a knee to get up close to the leaves. 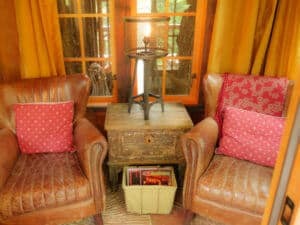 “Glamping”—upscale camping – is in vogue these days as many of us aging children like to feel like we’re “in nature,” without, you know, actually roughing it. Pete Nelson’s show “Treehouse Masters” has popularized treehouse glamping and more and more resorts, hotels, and Airbnb’s are offering treehouses – many of them upscale – as an option. I revisited my childhood treehouse fantasies last summer by staying in a few of the best treehouses located a (relatively) easy distance from Seattle and have many more I’m adding to my treehouse bucket list. 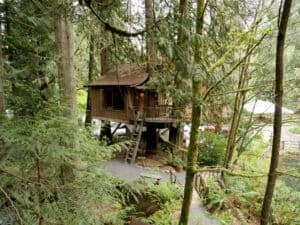 Here’s a lowdown on the high-up places we stayed followed by a listing of other treehouses around the Pacific Northwest that you can rent. 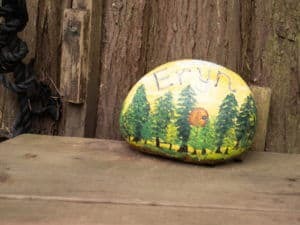 If you want to see additional photos we took at the treehouse we’ve visited there’s a link at the end of each section or you can click here to see a gallery of more photos from our treehouse visits. Premier treehouse B&B created by Pete Nelson of “Treehouse Masters” fame. 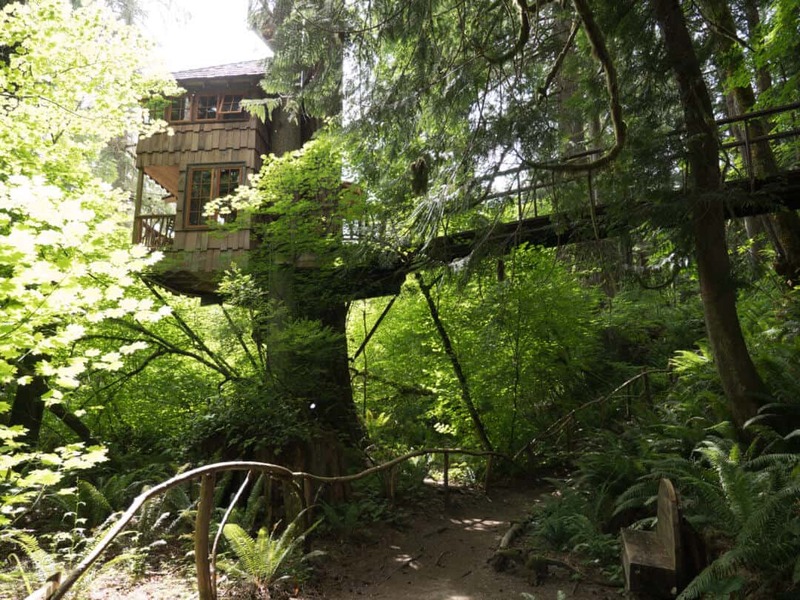 First stop: Treehouse Point, a must-visit for anyone with a goal of visiting treehouses. 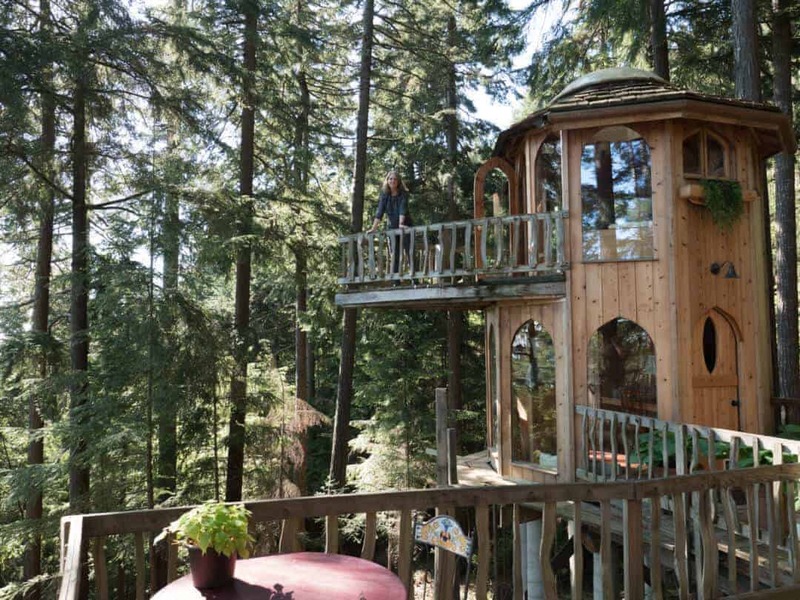 “Tree Whisperer” Pete Nelson’s treehouse B & B, Treehouse Point is situated on four acres in Issaquah/Fall City, WA near Snoqualmie. 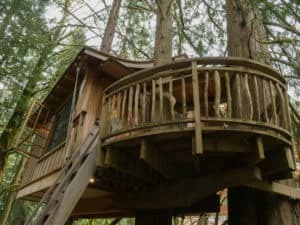 Treehouse Point offers six treehouses available for rent. 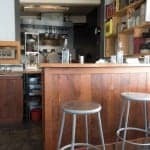 One of them – Trillium – was closed during our stay. 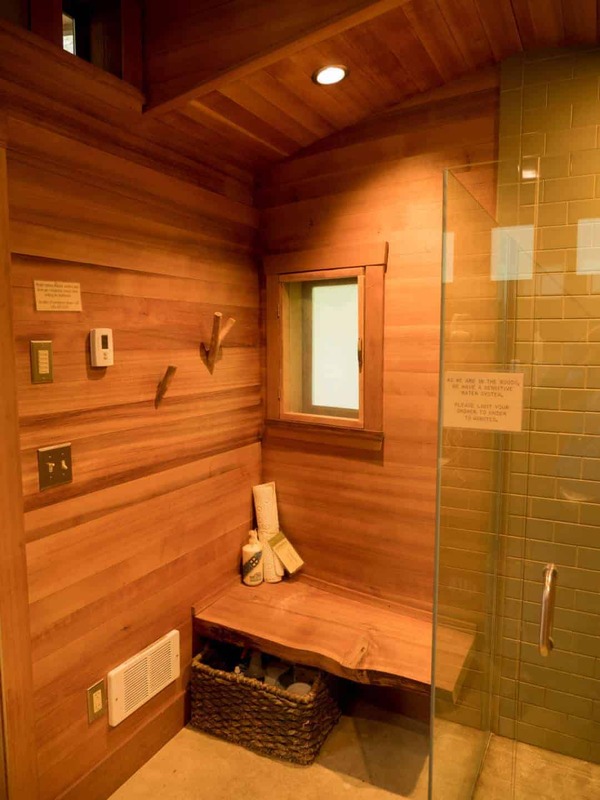 The treehouses themselves have composting toilets, but the nearby bathhouse has cozy cedar-lined bathrooms fitting with a rustic, PNW, treehouse-y theme. 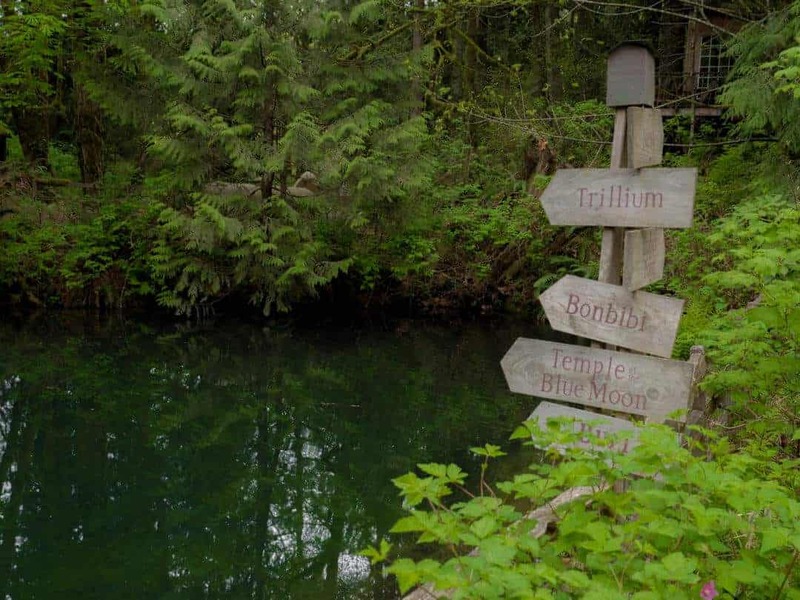 The Nelsons have owned the property on which Treehouse Point sits since 2004. The main lodge was originally an auto repair shop, and, although they told us on the tour that there are still oil wells below the floor, you cannot tell. 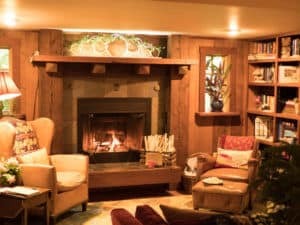 It’s a lovely place to have breakfast or to come out of your treehouse (if you want) on a cold, rainy evening, sit by the fire, have a cup of tea, and read a book or play a game. 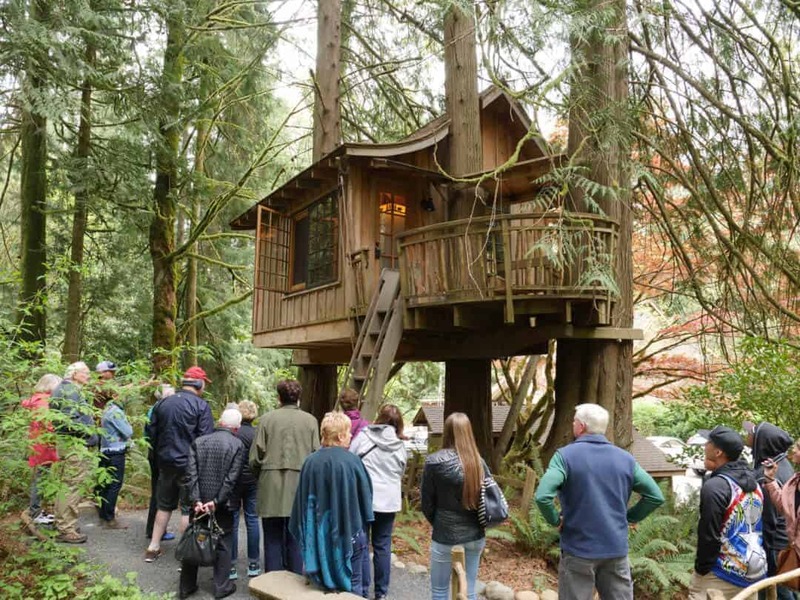 In 2020, the Nelsons will be opening another treehouse Bed and Breakfast – Treehouse Resort and Spa – which is an immediate add to my treehouse bucket list. 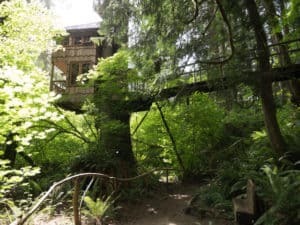 Inspired by the Parthenon, this “temple” is the one that always gets pictured when you see Treehouse Point and the suspension bridge leading to the entry is, possibly, the most Instagrammable spot on the property. 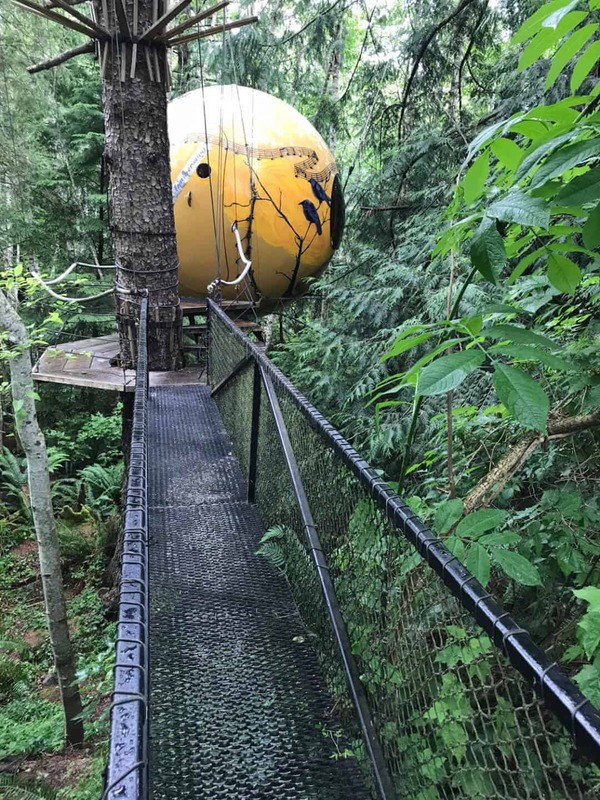 Trillium closed during my visit, so I didn’t get to see the interior, but what’s striking about this treehouse is its height – 16’. 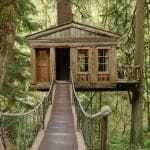 This one boasts the most significant capacity of any of the treehouses, housing four. During our stay, a family was staying there who was kind enough to invite us in for a closer look. 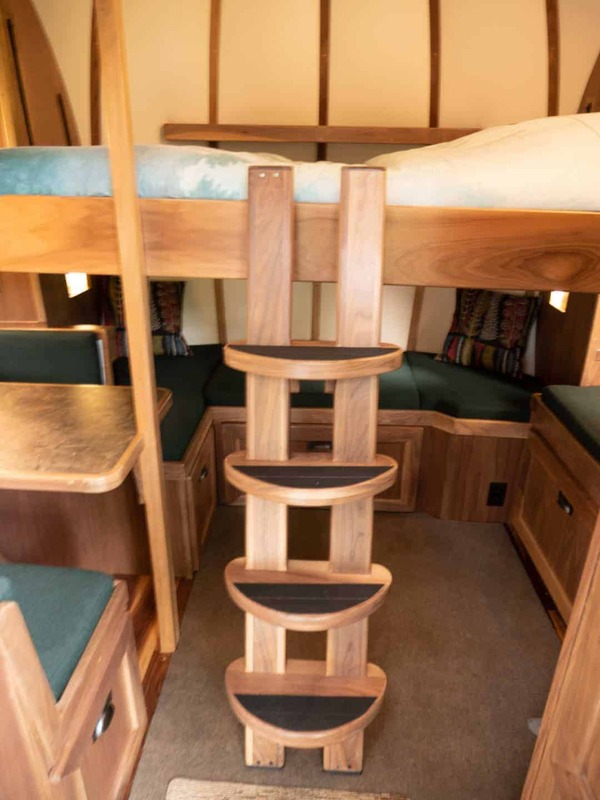 The bunk beds are popular with the kids, and it features a rope pully to get your luggage up – because to get up in the treehouse, you’ll need to climb a ladder. Nest was our nest at THP. 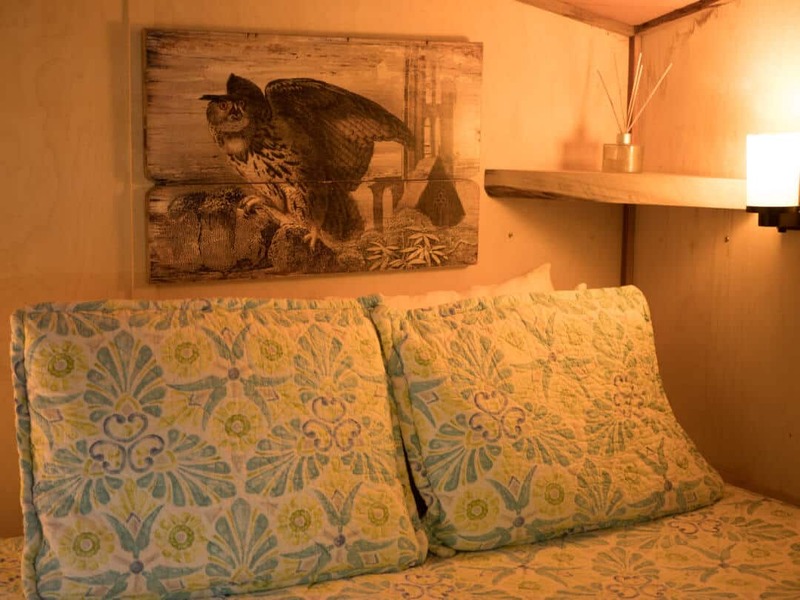 Bird themed, as its name would suggest, it’s the smallest of the treehouses, but would make a great solo writers’ retreat or a cozy “nest” for you and your lovebird. 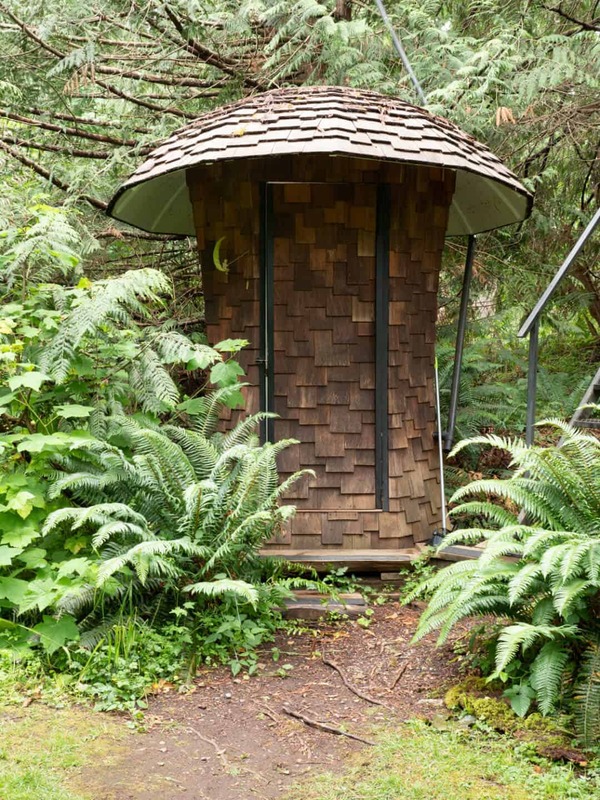 There is a tiny composting toilet outside the treehouse in case you have a nighttime emergency, but otherwise, you’ll want to climb down and go to the plumbed bathrooms. 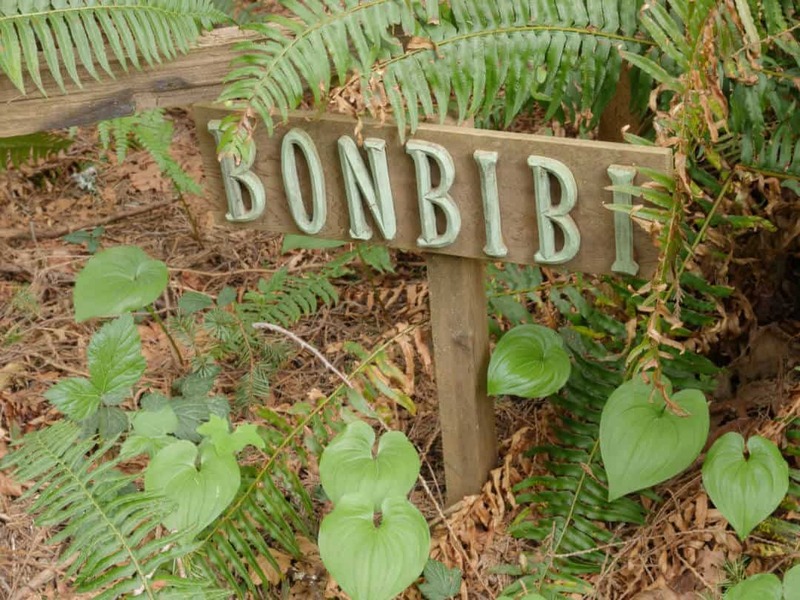 Bonbibi was a Hindu guardian of the forest and, I suppose, you can act in her stead and guard the forest in this high up gem which features a lower deck. This one is popular with the honeymoon crowd both because of its river view but – I think more importantly – because it has a half bath with an actual plumbed toilet. 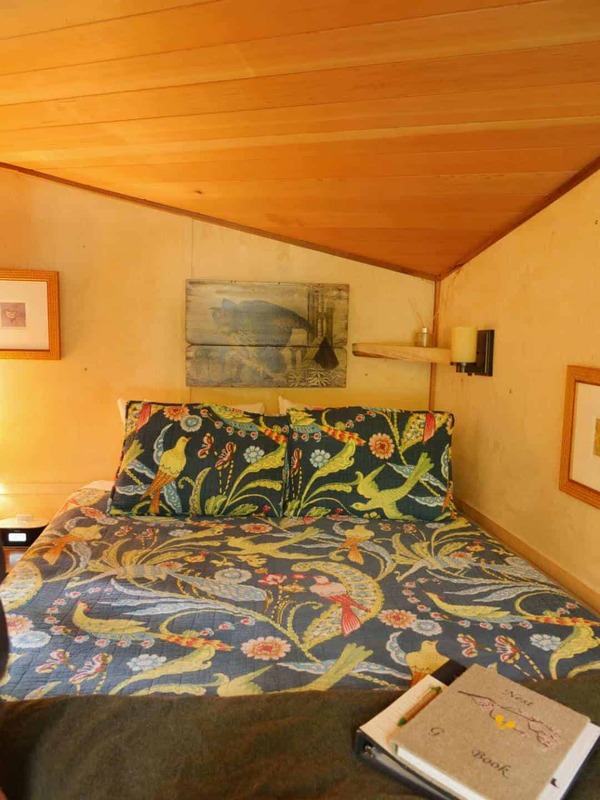 The climb up to the bedroom is steep, but there is no need to make a nighttime choice between a run to the bathrooms or using a composting toilet. 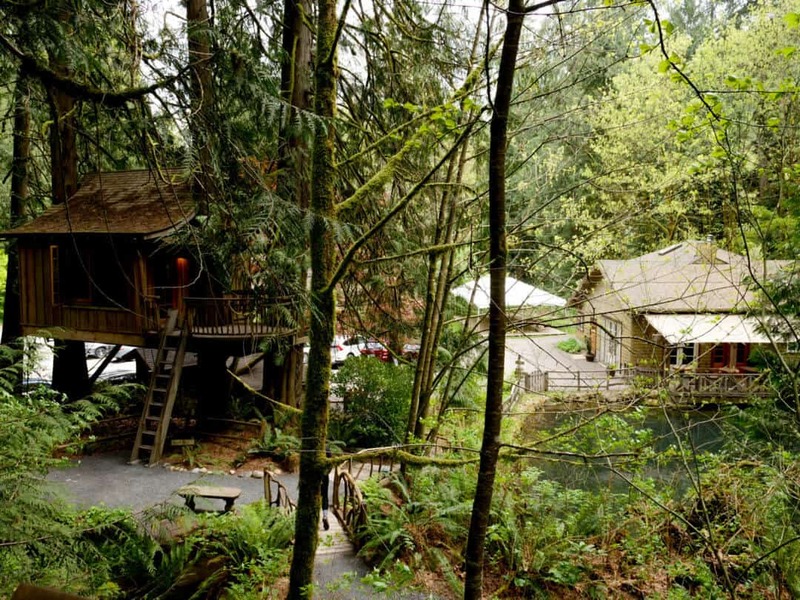 THP removed these treehouses of the past because their proximity to the river didn’t comply with King County codes. 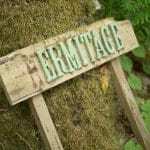 But the sign for the “ermitage” can still be found in the forest near the river. Staying in a treehouse doesn’t come cheap – prices aren’t available on the site; they ask that you email them for current availability and price details as availability and prices vary. Be sure to book early. Reservations fill up rapidly and, especially during the summer, weekends fill up for weddings, especially if you’re interested in booking The Burl. 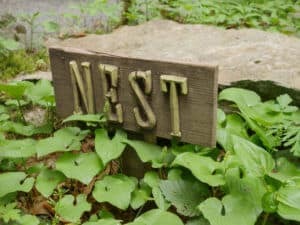 For us, one night in Nest was in the $300 range and we were very fortunate to find a one night reservation at the last minute. 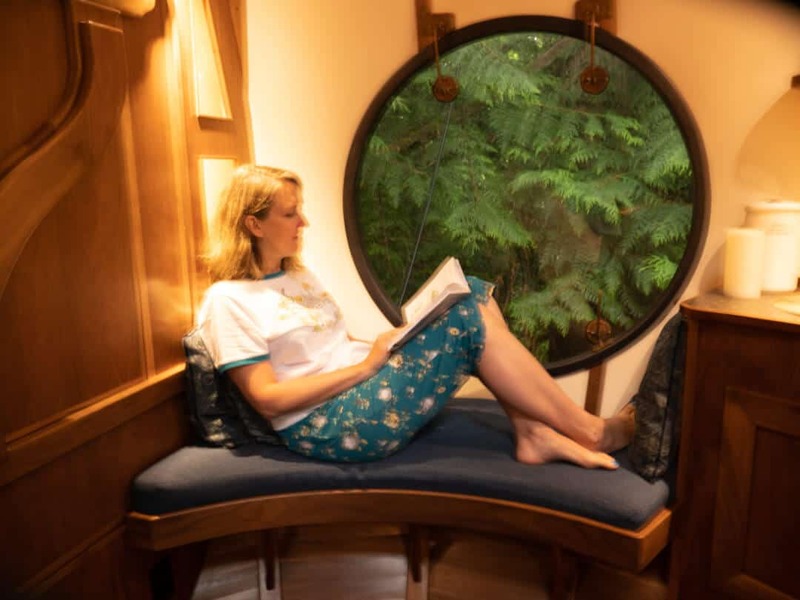 However, if you want to check out the treehouses at Treehouse Point without staying the night, you’re in luck – they offer small group tours. Tours are popular and draw visitors from all over (I was one of the few locals in my tour group), so reservations are a must. The cost is $25 for a one-hour tour. New tour dates for the month open up at 2 PM Pacific Time the first Tuesday of the previous month. You’ll have to get dinner in town. Fortunately, there are plenty of restaurants in nearby Snoqualmie (see below). 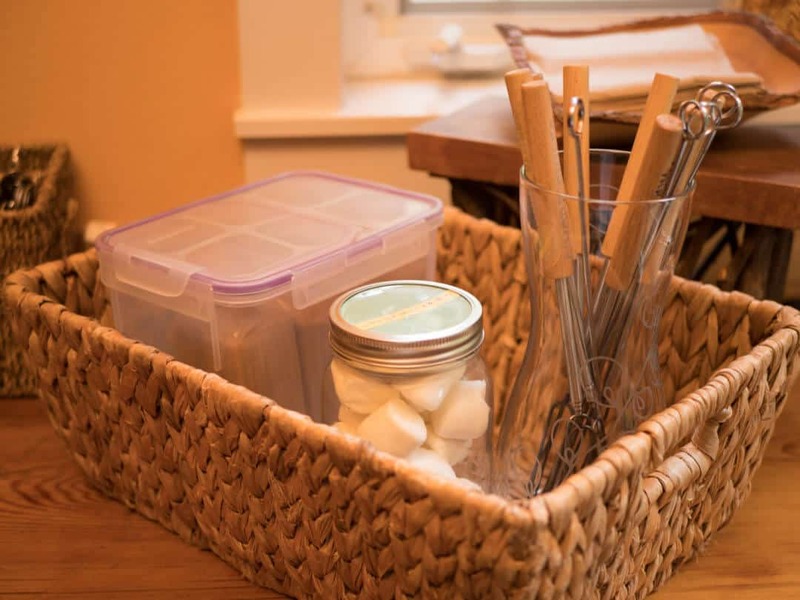 But there are snacks, cocoa, and a basket for making (indoor) S’mores in the lodge in the evening and breakfast in the morning is delicious, served up by our gracious host, Bird. 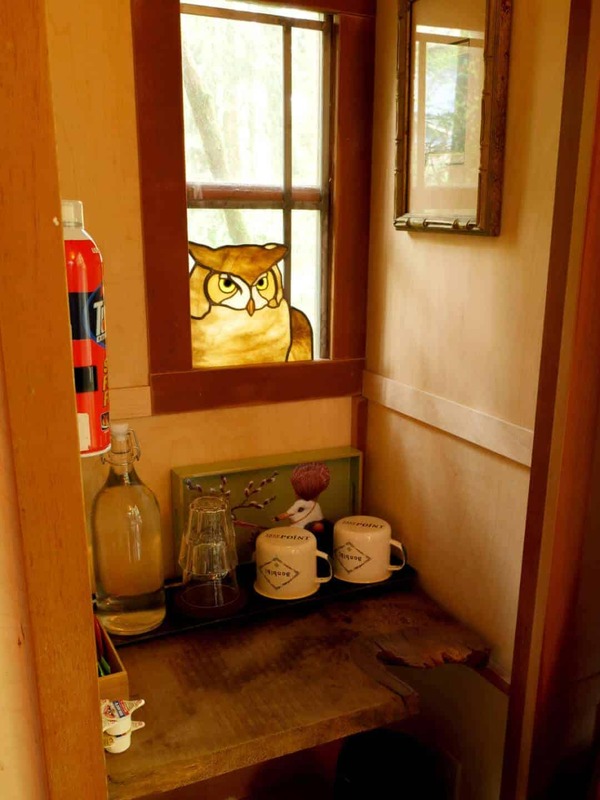 Breakfast is served at the grand table in the lodge with other treehouse-dwellers. I would provide photos, but I had my spouse reminding me to be polite and put away the camera. 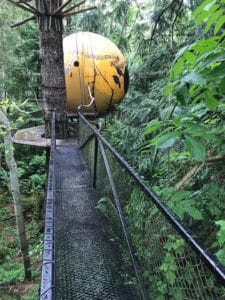 The call of nature is a concern at many of the treehouse locations as plumbing a treehouse presents its own set of challenges. 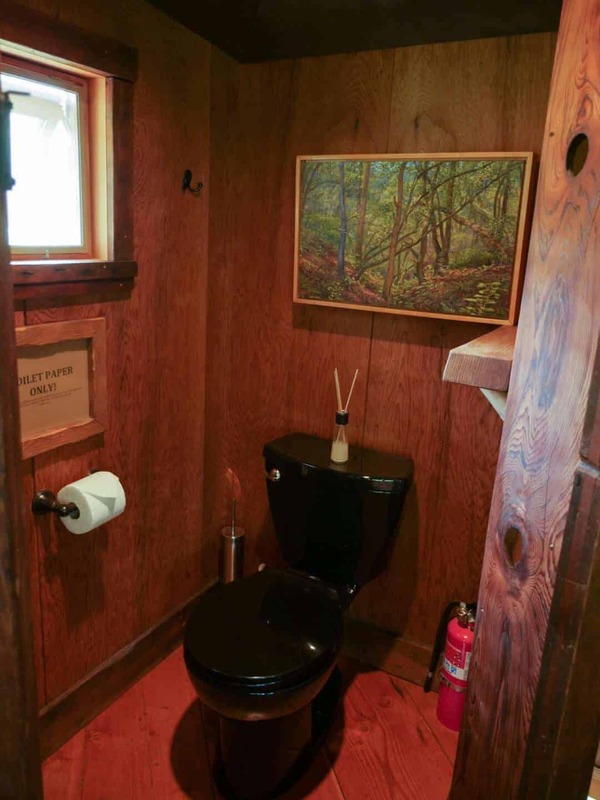 Only one of the treehouses at THP has a plumbed toilet. Most have composting toilets so it’s best to use the main toilets as much as possible, especially if staying in Nest. 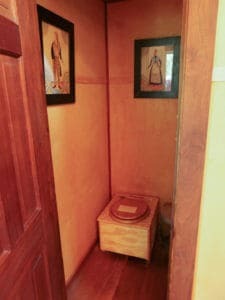 Fortunately, the bathrooms are lovely, cedar-lined things, fitting with a rustic treehouse resort. 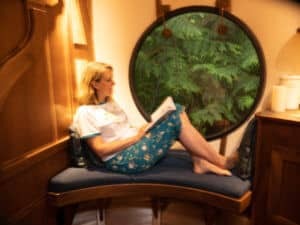 Though you’ll want to spend most of the time hanging out in your treehouse (that’s why you came, isn’t it?) 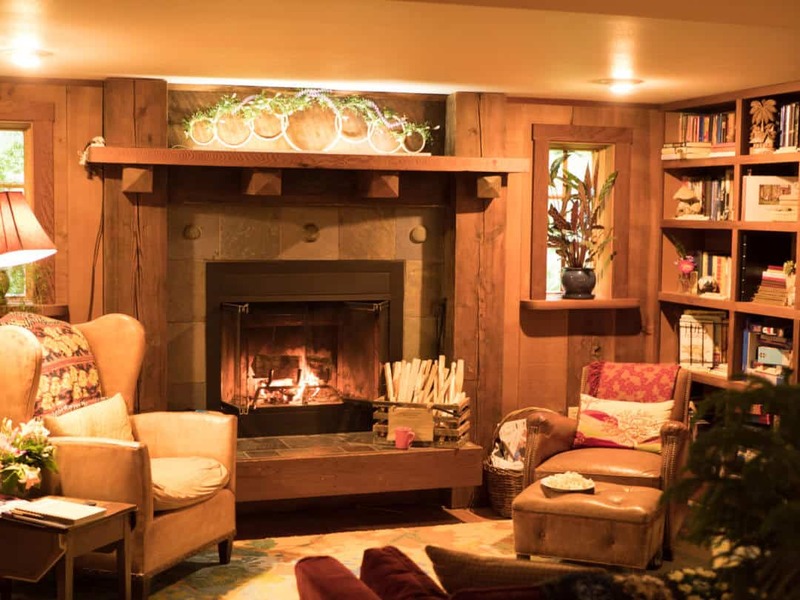 the lodge is a comfortable place to sit by the fire on a cold evening, read a book, play a game, and have a cup of cocoa or tea. If you’re into Yoga or TaiChi or want a massage, all are available – but you’ll need to check the schedule and arrange it in advance. 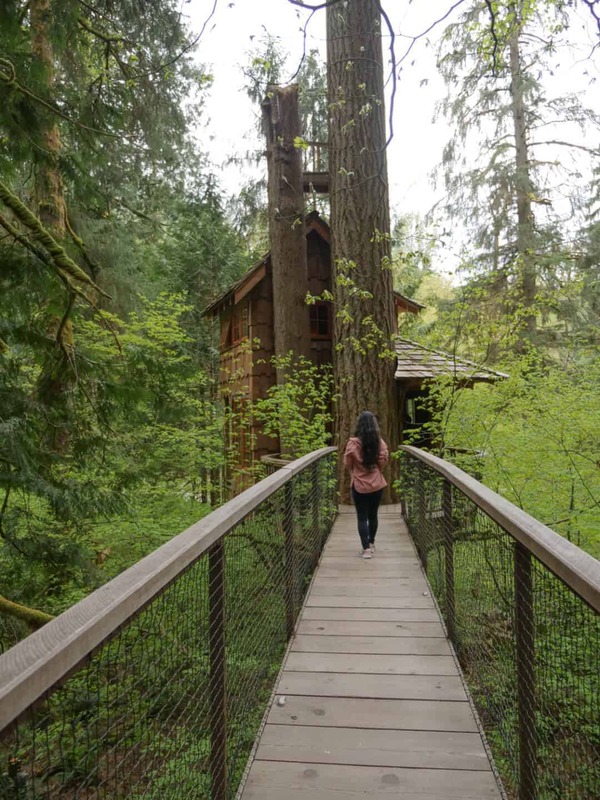 If hanging out in your treehouse, sitting by the pond or hiking down by the river isn’t enough, there’s plenty to do in nearby Snoqualmie. For dinner, we’ve eaten at Woodman Lodge, a restaurant that’s situated in a 1902 fraternal hall and has mid-priced casual American fare. 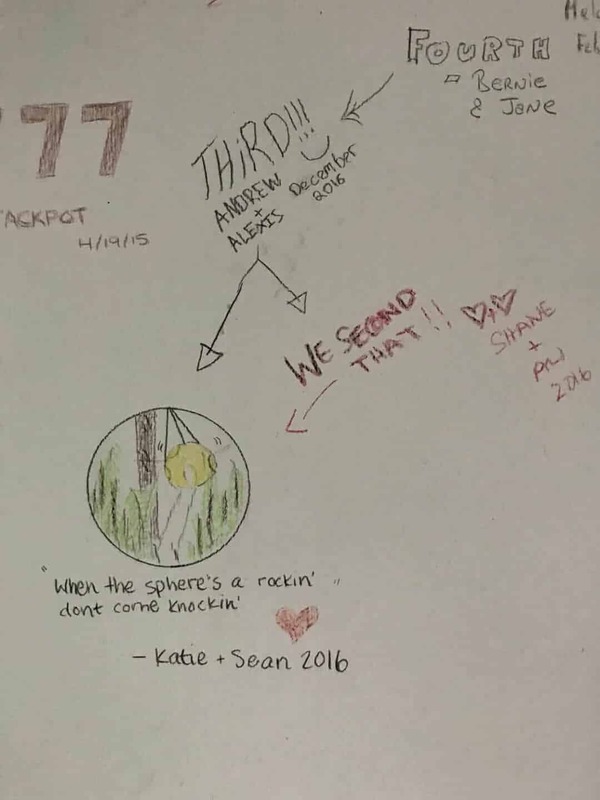 If you want pub fare, the Snoqualmie Brewery and Taproom is the place to go. 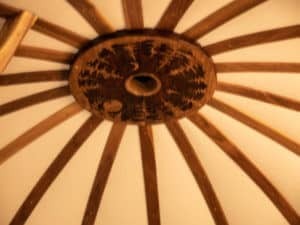 If you want fine dining, you can head over to the Salish Lodge (another one of my favorite PNW luxurious getaways). 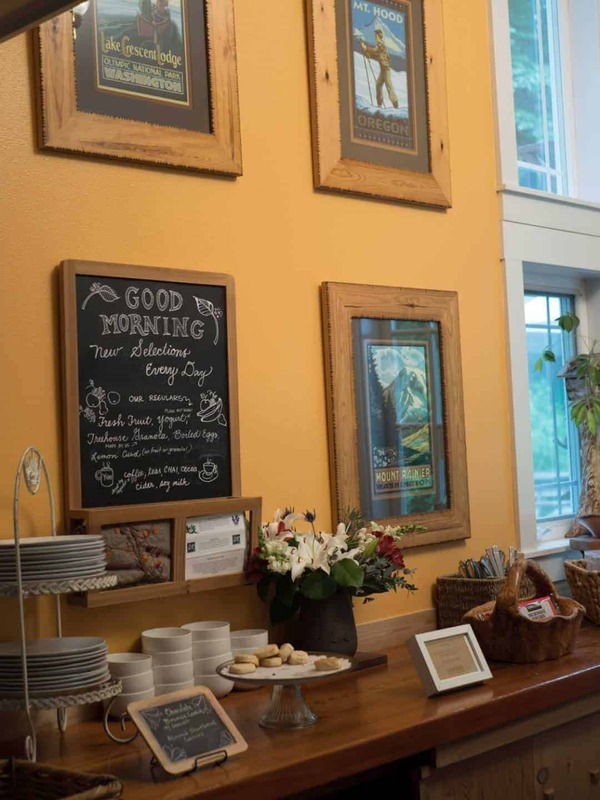 The Salish Lodge also offers the traditional Snoqualmie Falls Lodge breakfast (though it appears they’re not calling it that anymore), but you’ll be wanting to eat at the Treehouse Point Lodge during your stay – put that one on the to-do list for another time. For more hiking, take the hike down to Snoqualmie Falls or, if you’re into trains, visit the Railroad Museum which offers train rides on weekends during the summer. We’ve also taken summer bike rides from Snoqualmie to Remlinger Farms and back — time it right and you can stop and pick berries enroute. 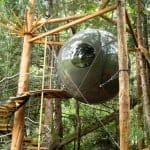 Unique spherical treehouses in Qualicum Beach, BC. 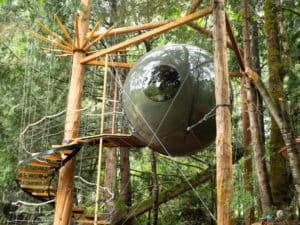 If you want to stay in a truly unique treehouse, this is your place! 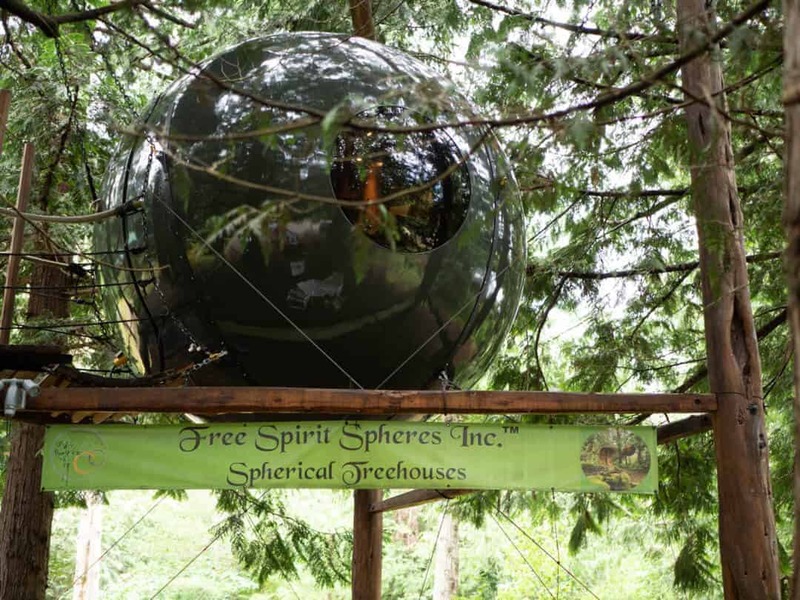 The spheres live in a magical wooded facility in Qualicum Beach, BC near Nanaimo. I understand, though, that they are looking to relocate to a larger property to expand, so this article may need an update shortly. 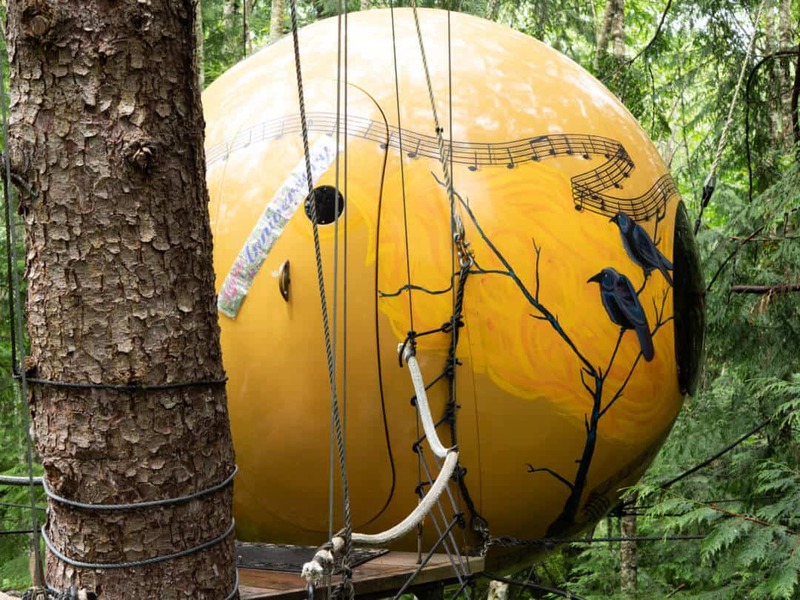 Franchising is also, apparently, in the works, for those who want to open a sphere resort of their own. There are three spheres with free spirit here: Melody, Eryn, and Luna. 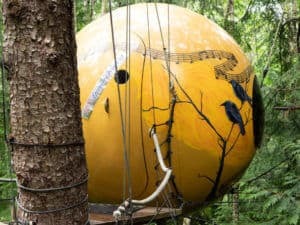 This fiberglass sphere was our sphere-of-choice due to availability and the fact that she could house both of us, though space is, of course, a bit cramped unless someone accompanies you with whom you feel very comfortable. 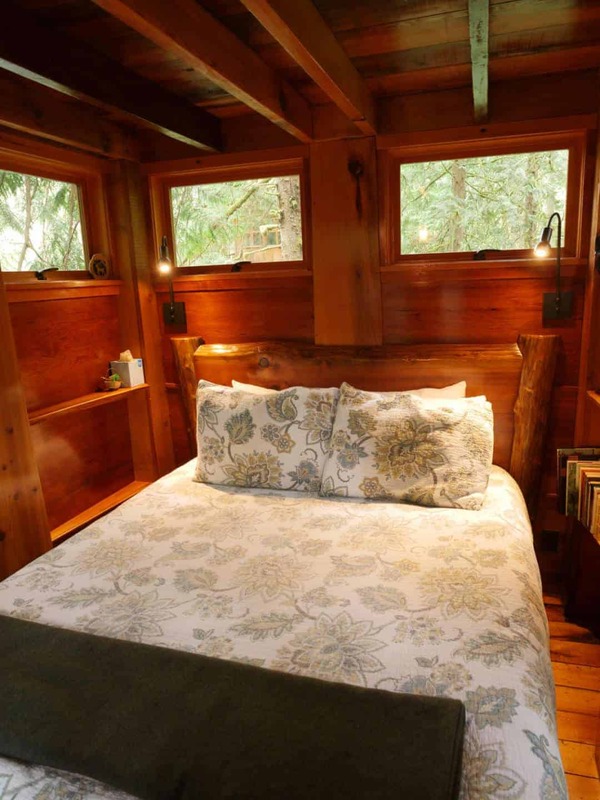 The fold-down Murphy bed was very comfortable, and the window seat by the round window make a cozy place to sit, write, and listen to the rain come down. 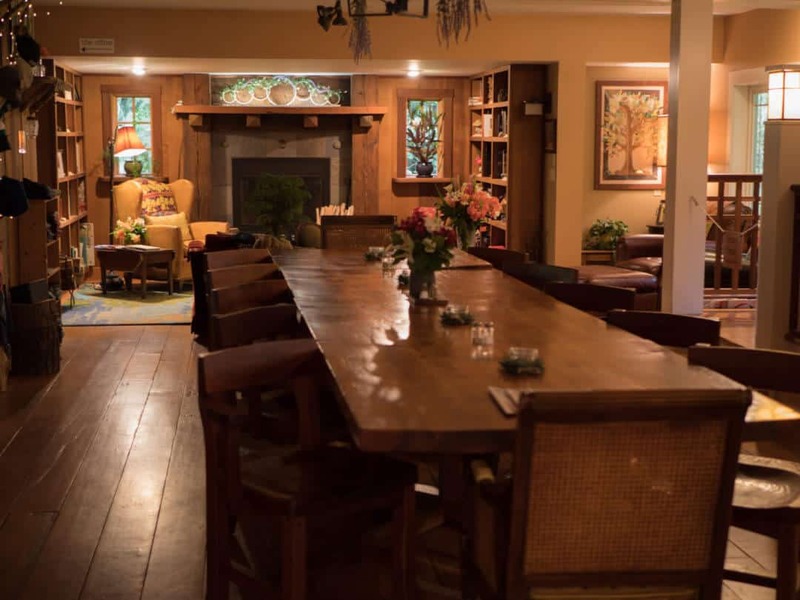 Melody, I think would make a great writing space for a solo writers’ retreat – she features built-in speakers and fold-down tables for eating or writing. However, I did find wi-fi (and LTE) coverage spotty here so that it would be an excellent place for a disconnected, device-distraction-free, writing retreat. What’s it like staying in Melody? 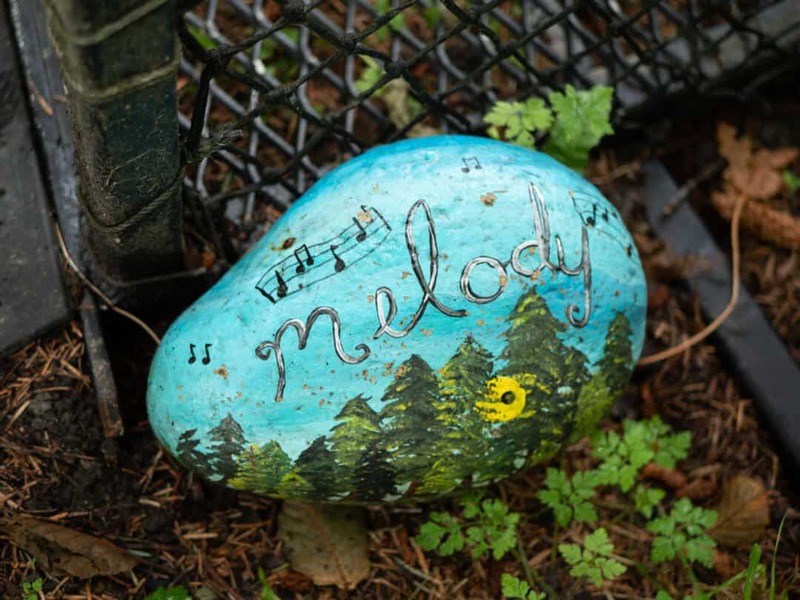 I am frequently comforted by the sound of rain, and visiting in Melody during a rainstorm gave Melody the chance to live up to her name. In a gentle wind, or with motion, Melody gently rocks which is, at first, a bit disconcerting but then you get used to it. They do give rules about conditions that will necessitate getting down from the sphere. Eryn is a wood sphere with a spiral staircase which can sleep two, and potentially, a third in a loft bed. Luna is the newest sphere – I was fortunate to be able to take a peek at it before the next inhabitants arrived. This one is a gem, featuring a bed with a hydraulic lift, though we didn’t find it too challenging to get Melody’s down. Like Treehouse Point, the spheres’ property has a pond which makes a nice area to get out and walk when It isn’t raining. When it is, the covered porch by the bathrooms makes a nice place to sit, watch the rain, and, if you’re lucky, watch baby birds in a hummingbirds nest (though that was likely to be a special treat that happened to occur during our visit). However, this may be out of date soon as when we visited they were looking to relocate in the near future. Each sphere has a comfortable, individual, bathroom in this building, so you don’t need to worry about sharing or hogging a one during your stay. You can check their calendar online to start the reservations process – but actual reservations are made by phone. They telephoned to let me know when reservations would open up for summer (in the spring), but reservations fill up fast, so you need to call them back promptly to get your first choice. In truth, I was booking because I wanted to stay in the spheres, but it happened to be close to our anniversary, so I booked a package with a treat basket. There was a LOT of food, and it got us through our first night in the sphere, and breakfast too. But, otherwise, there is no restaurant here so you’ll need to go into town to eat. We didn’t stay long enough to sample every restaurant in town, but for dinner, a restaurant we’d recommend is Cuckoo Trattoria and Pizzeria in Nearby Coombs. It’s located in the lovely Old Country Market — so you might want to budget some time for shopping. 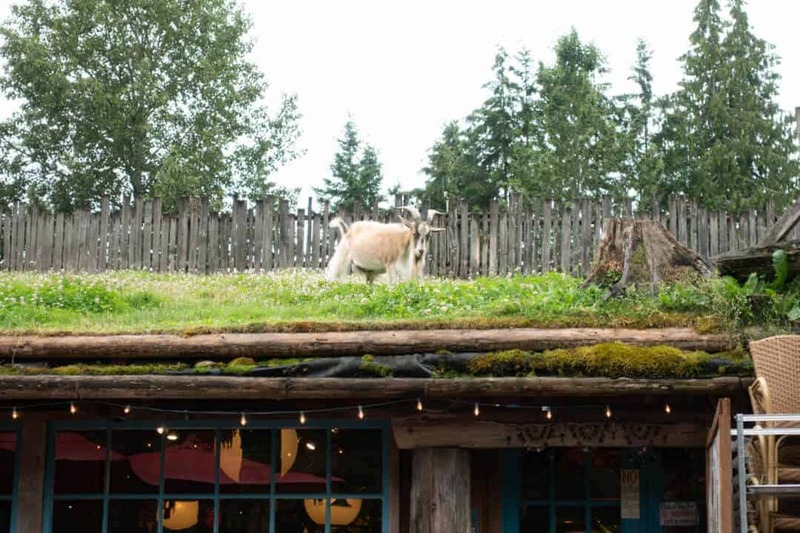 While you’re in Coombs, you might want to visit Goats on the Roof. Yes, it’s a touristy gimmick, but it also has a grocery with a good cheese selection and a store with a bunch of various (and reasonably priced) household items and toys. I didn’t see any goats initially and almost asked where they were. I’m glad I didn’t. They are precisely where the name implies. 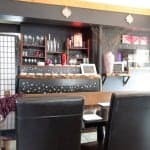 If you’re interested in fine dining during your stay, Bistro 694 in Qualicum beach was excellent, both in menu and atmosphere. We arrived early and were lucky to be able to get in without a reservation – but you should make one as tables fill up fast. 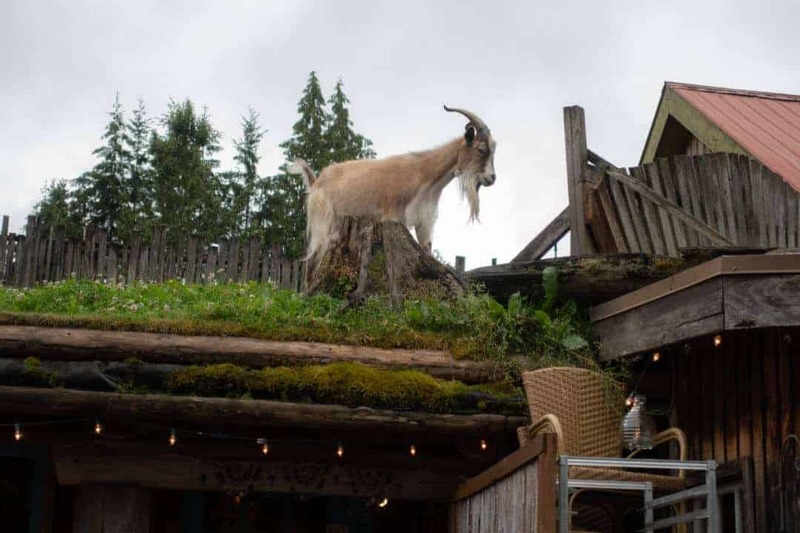 Other than goats on a roof, while you’re staying at the Spheres you might also want to visit Qualicum Beach if weather permits, go hiking in Heritage forest, or visit the town of Qualicum beach if browsing shops is your thing. 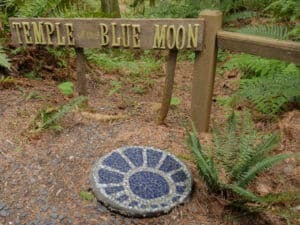 A truly magical (and I don’t overuse the word) on Orcas Island, WA. I can’t say where the exact address is, but it’s in this vicinity. 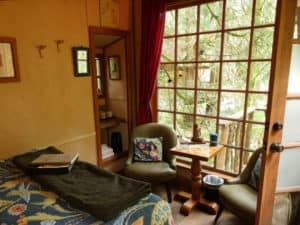 The Forest House on Orcas Island (I love it so much I also mentioned in this post) is, hands down, one of my favorite places to get away from it all and relax. Currently, it’s renting on Trip Advisor for $175 per night. Until 2016, this gem of a place bore the name “The Hobbit House” for its distinctly…hobbity…features. But, unfortunately, the word “Hobbit” turned out to be trademarked by Middle Earth Enterprises, and Suzanne, who owns the Forest House (Can I buy it? I want to live there.) had to change the name. But hobbits live in holes in the ground, and this place is, distinctly, in the trees. Perhaps, it would be better suited to inhabitants of Rivendell, and a name change was in order. Technically it’s not an actual treehouse. Pillars support the structure, but its place among the trees at least earns it at least the title of an honorary treehouse. Kids will appreciate the tower, as will kidults who still have a Disney princess fantasy. Writers looking for a retreat will also enjoy the tower, which has a desk area with computer hookup. 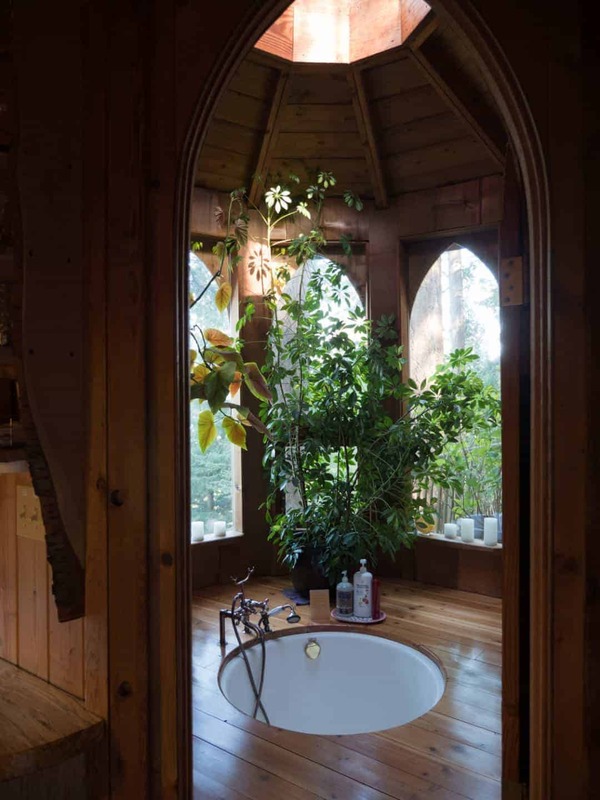 The tub room features a deep sunken tub, perfect for a bubble bath, with a high ceiling, surrounded by plants. The kitchen is small but as charming as the rest of the house, and we spent plenty of time on the large wraparound deck. And the house is mostly very private – except that I encountered a drive-by photographer, who apologized when I walked out and quickly drove away. We cooked clams, a very PNW dish, when we stayed at the Forest House. We had no specific dinner plans on our trip, but we got lucky. Walking around in Eastsound, a sign on a small restaurant boasting “Agrarian Cuisine” drew me in. Despite the price tag, I was curious and wanted to sample this agrarian cuisine and was able to get a reservation for that night. I’m glad I did. Ælder shares space with Hogstone Wood Oven – a woodfire pizza restaurant. 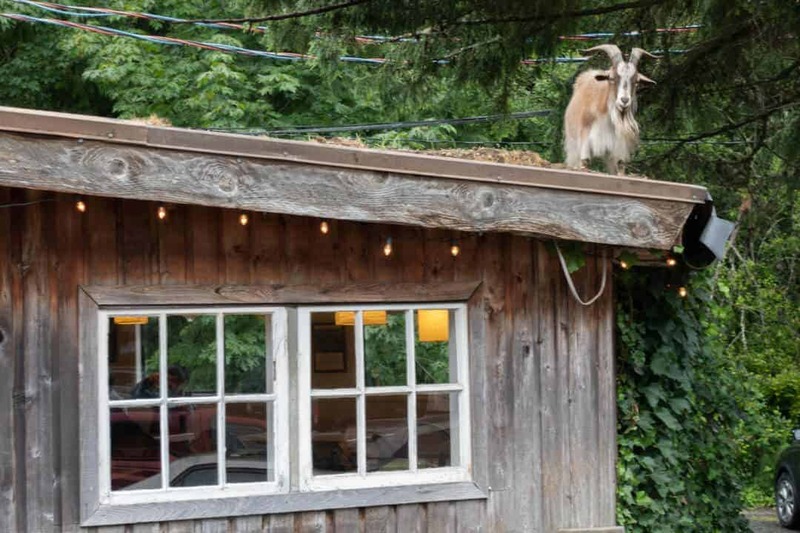 Both restaurants are owned by Jeff Blackington, a farmer and chef offering farm-to-table cuisine. The multi-course meal was nicely presented and, in addition to its more creative cuisine, also provided a slice of the woodfire oven pizza along with a special surprise that I won’t reveal, but might delight you if you grew up near Seattle. Mia’s was a good place to get a latte and breakfast in the morning. 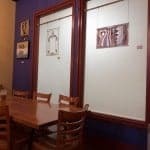 I like the funky artwork and the purple walls – a cheery place to get going in the morning. If you want to dine outdoors, the Madrona has an outdoor seating area with beautiful views overlooking the water. The seafood was adequate the price was reasonable, and the view was stunning. Mijitas gets an honorable mention, since we didn’t eat here – but plan to next time. The outdoor courtyard attracted me, lit up at night with string lights. And, I understand, the food is good as the atmosphere. 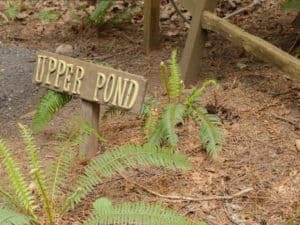 You’ll want to stay and enjoy the Forest House itself and walk on the nearby beach…but there are plenty of other things to do on Orcas. 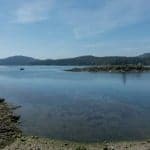 While you’re on Orcas Island, besides shopping and eating in Eastsound, you might want to visit Moran State Park (this was one of our favorite spots to camp with the kids when they were younger), take a hike up Mt. Constitution, go on a whale watching trip, or go kayaking. Though I own a kayak, I’d be careful to only use it in areas I know to be very protected. For other areas, or to go on an orca viewing kayaking trip, I’d go with an experienced guide. OThe only reason this is getting “honorable mention” is that I haven’t been able to stay here. 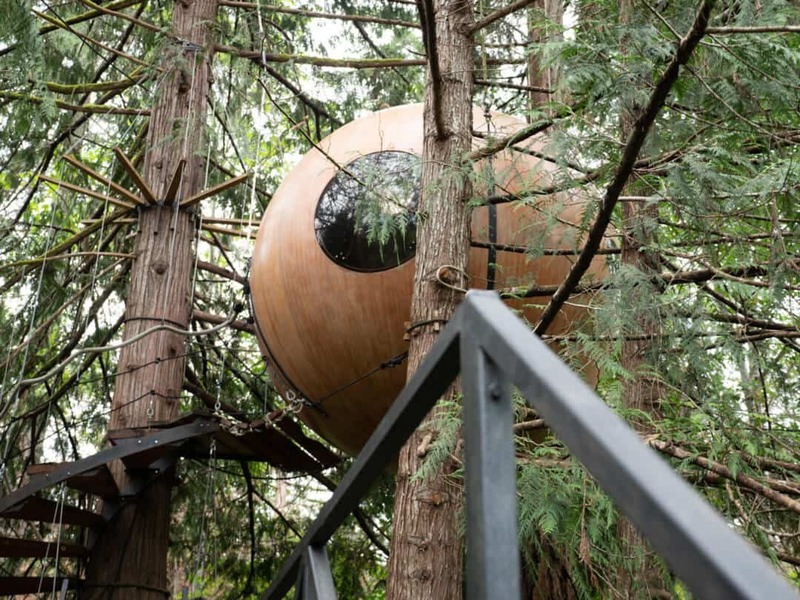 You have to book way in advance to get into this favorite treehouse. At the time of this writing, it appears that it’s scheduled through the summer of 2019, at least. But I have been to Doe Bay, though not for several years – and I want to go back. 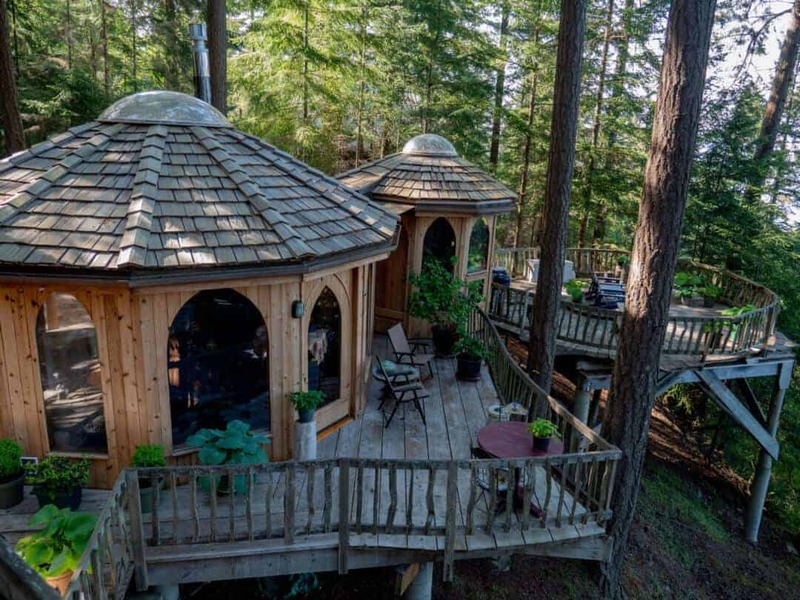 Doe Bay is a great area for camping, offering tent sites, or upscale yurts, if treehouse glamping isn’t your thing or the treehouse is full. And it has a nice hot tub and sauna area. But be warned: when I went there in the past, the hot tub and sauna was clothing-optional (and, apparently, still is), and people do choose to take a dip in the altogether, which made some moms I knew uncomfortable about going near the hot tub with kids. 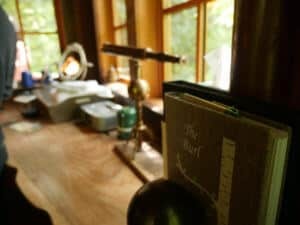 I’m hoping to revisit Doe Bay this summer…but it won’t be in the treehouse this year. 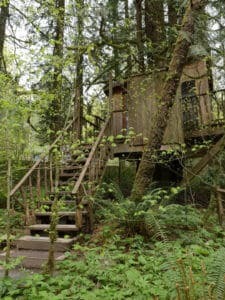 These are treehouses in Washington, Oregon, Idaho, or lower British Columbia that I haven’t had the opportunity to stay in (yet) in so I can’t give them my personal review and the image sources are from their individual sites. Right now there’s a heavy emphasis on Washington but I’m planning on continuing to update this post. 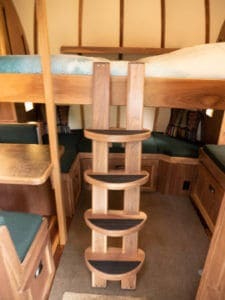 If you know of a treehouse that you think should be listed let me know. Likewise let me know if you find something that’s no longer current. 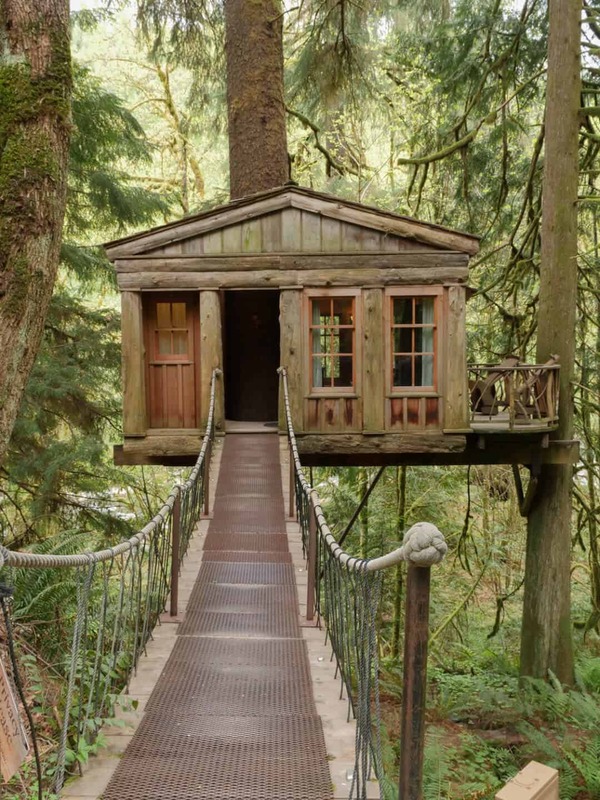 Stayed at one of these treehouses? Share below in comments. 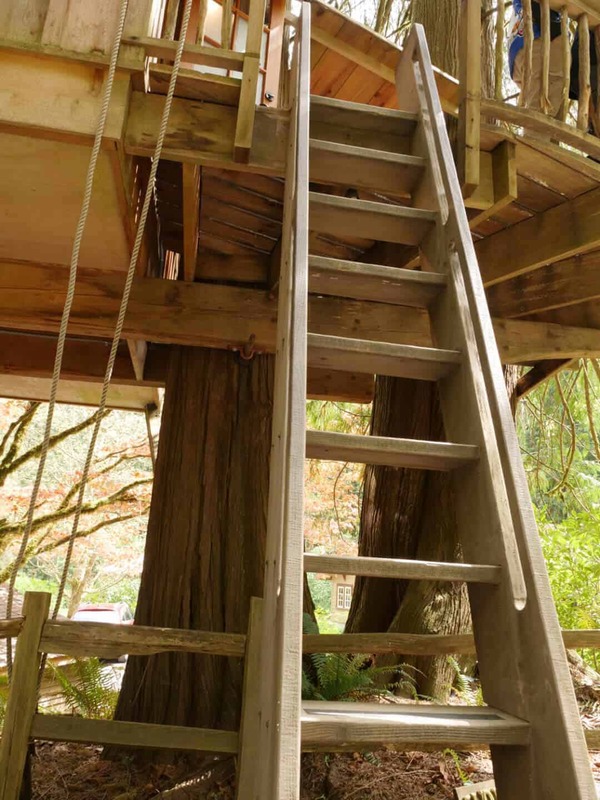 Jump down to the treehouse listings or treehouses in Washington, Oregon, Idaho, or BC. 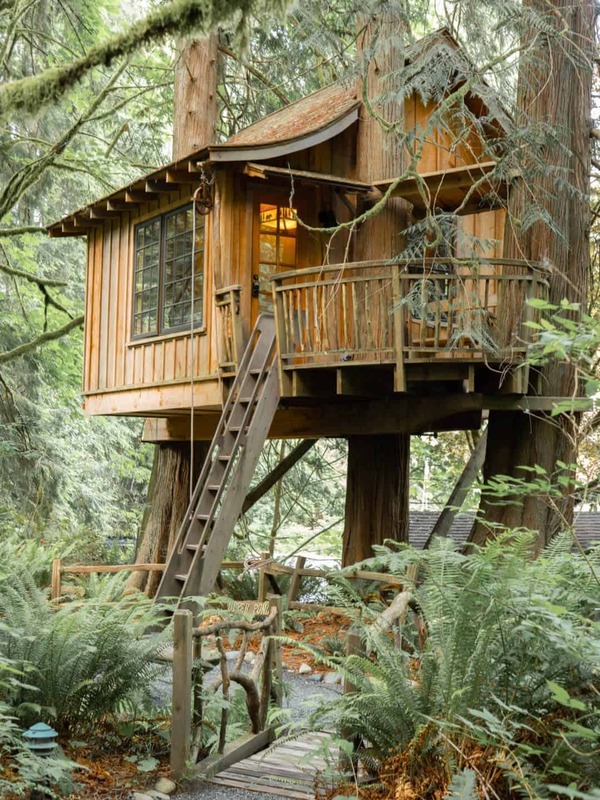 This one is near the top of the PNW treeehouse bucket list as it’s in the San Juan Islands. 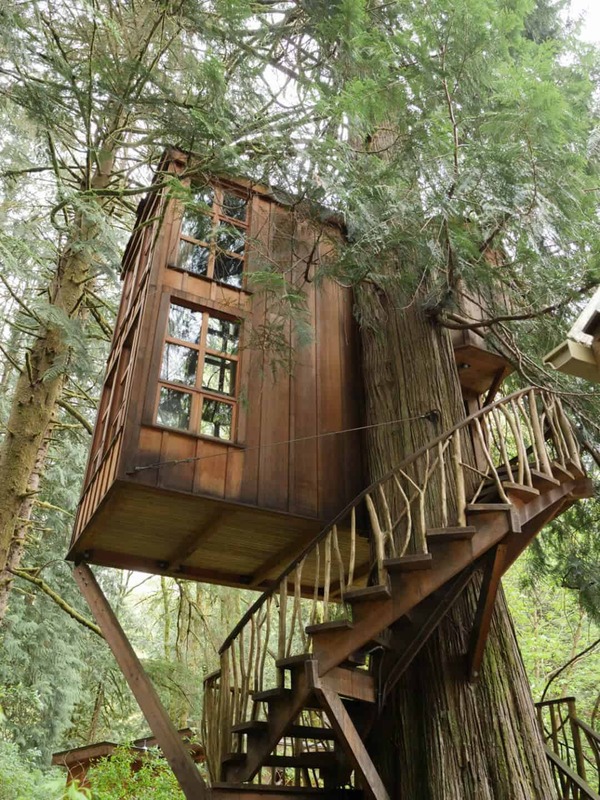 It’s one treehouse, maximum three guests. It looks charming and the views appear spectacular. It rents on AirBNB for $249 per night. 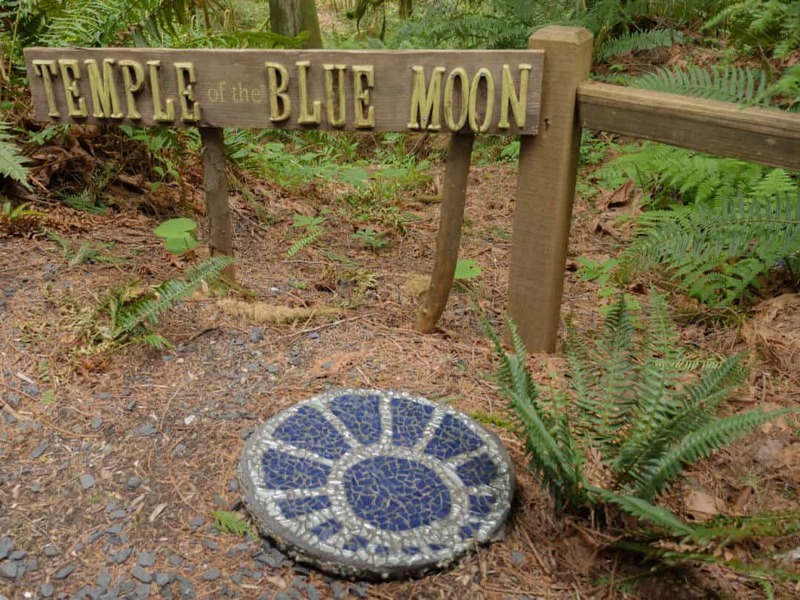 It’s located near the north of Lopez Island. As it’s an AirBNB, exact address is provided on booking. 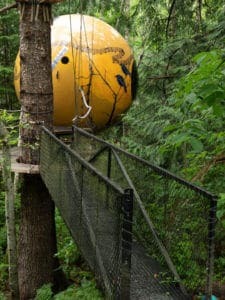 The Skamania Lodge Treehouses appear to be elevated cabins and not actually built into the trees. 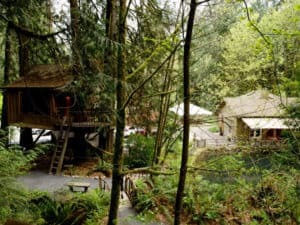 But I definitely would want to go, as they’re near the Columbia River gorge in Stevenson and I’ve been past Skamania lodge and it, itself, is on my list of places to stay. These go into the luxury treehouse category and start at $419 per night. 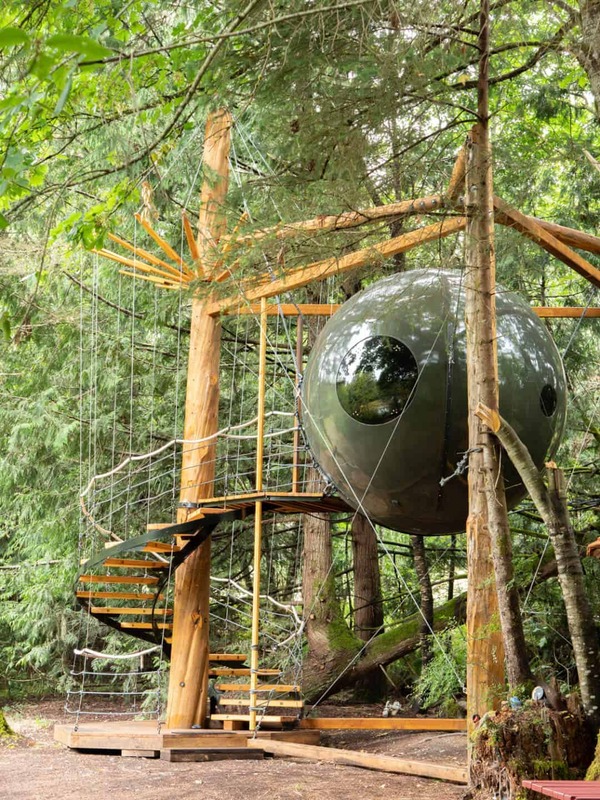 This one looks like a definite treehouse bucket list add if you want a couples retreat. It’s definitely a real tree house –the trunk runs smack through the center of the house. 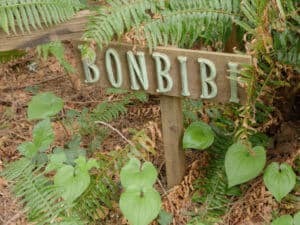 It’s also located in Stevenson, WA near the Columbia River gorge. This treehouse books through Glamping Hub from $351.26 per night. It’s in Stevenson, WA but, because it’s a private retreat, address is available upon booking. Sir Cedric’s looks like a cozy rustic retreat for two with a high, beamed ceiling and a four-foot wide red cedar that runs straight through the house. This one is moving up near the top of my treehouse bucket list. Sir Cedric’s rents through AirBNB for $175 per night. 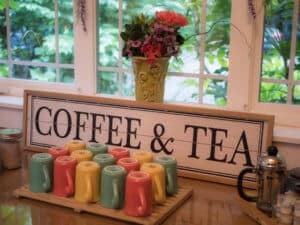 It’s in Ferndale, WA but, because it’s a private retreat, address is available upon booking. 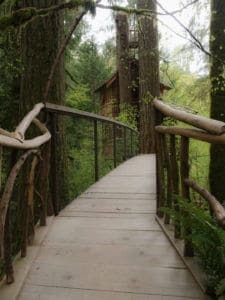 Another treehouse near the Columbia River, this one’s situated on the Washougal River. Cozy spot for two, riverside hammocking, and a price tag of under $100 per night. What’s not to like? This one rents for $95 per night through Air BNB. 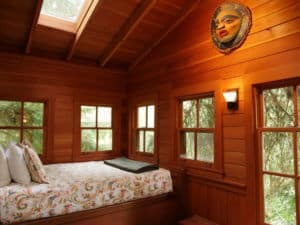 Because it’s an AirBNB rental, the location is only disclosed on booking, but it’s right on the river in Washougal, WA. This is a 250 sq. ft. octagonal treehouse in the woods — does not appear to be on the water, but close enough to Mutiny Bay (hey, it’s on an island so surrounded by water) to be easy to get to the beach. 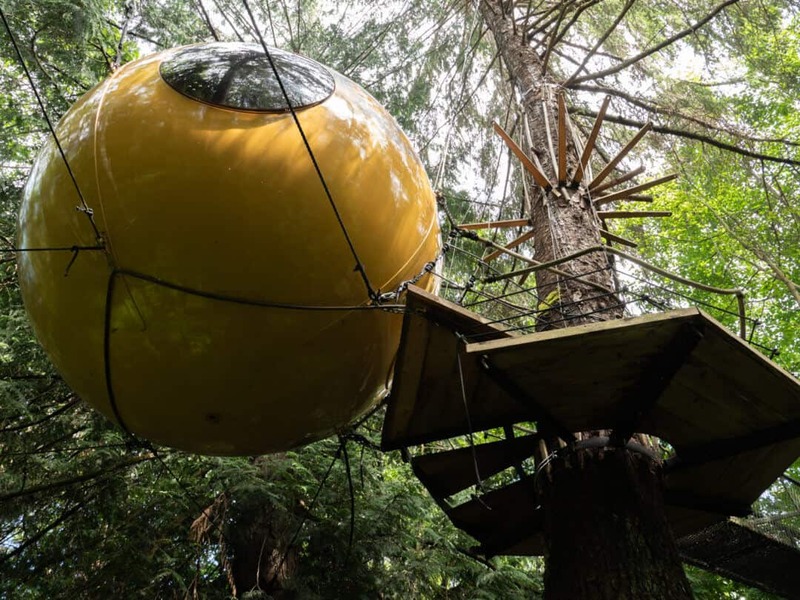 This treehouse rents for $130 per night on AirBNB. As it’s an AirBNB exact location is only available on booking, but it’s located on Whidbey Island in Freeland. 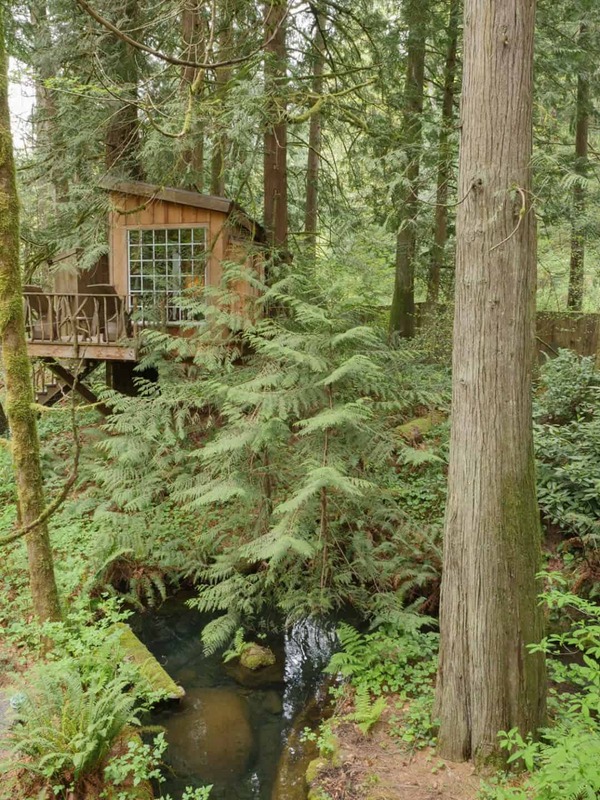 This looks like a tiny, but charming treehouse with a tree coming right through the deck and it features both kayaks AND a hot tub to sit in after you come back from paddling. I love both, so this one goes on the bucket list! 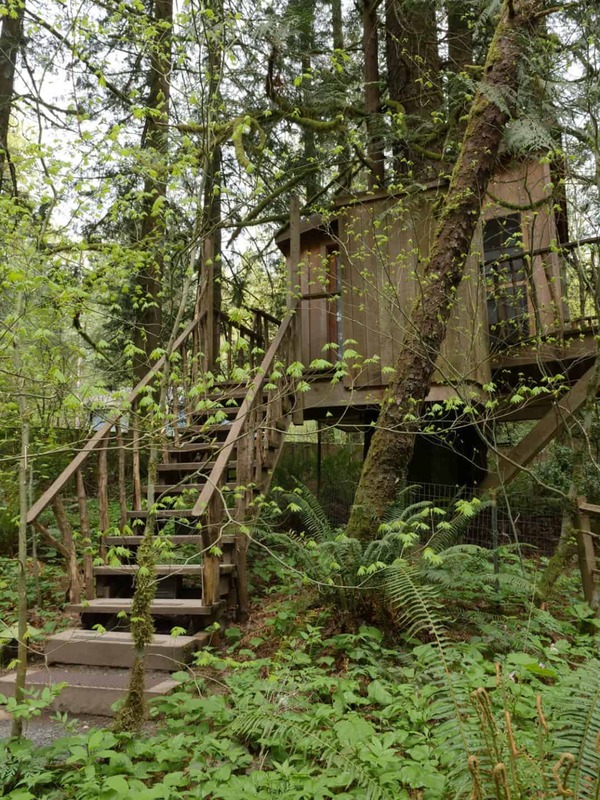 This treehouse rents for $115 per night on AirBNB. 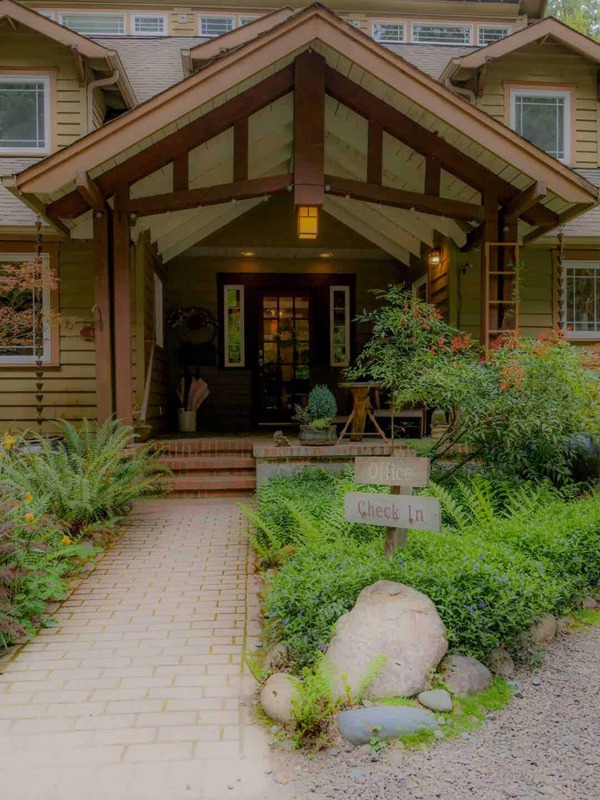 As it’s an AirBNB exact location is only available on booking, but it’s located in Gig Harbor, WA, apparently on Dutcher Cove. OK, Out ‘N” About Treesort is a “must-add” to the bucket list as it is another full resort dedicated to staying in the trees. This place has 18 treehouses, a swimming pool, a river, horses and chickens, swinging bridges and ziplines. Treehouses rent from $150 a night for two people in the Elementree up to $330 for up to four people in the Majestree and includes breakfast. Is Cave Junction, OR Treehouse City? 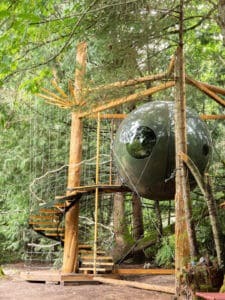 Here’s another treehouse resort in Cave Junction, OR. 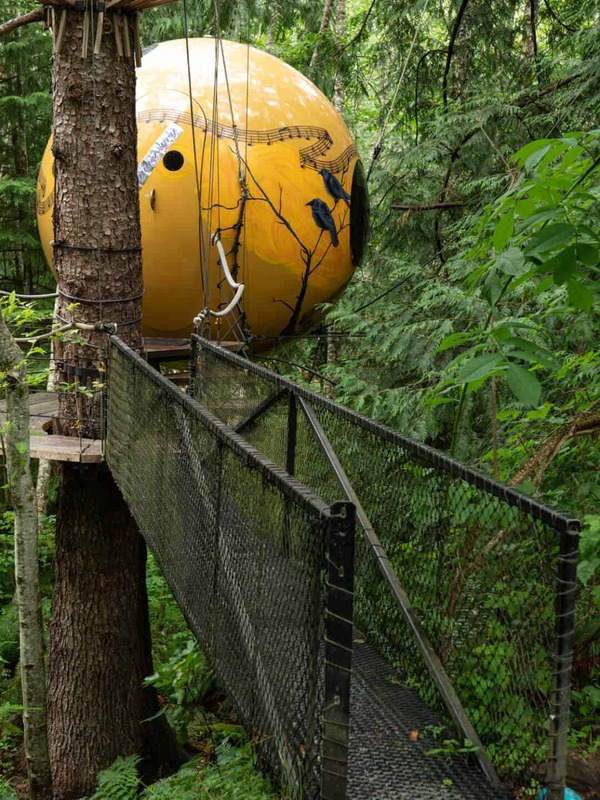 Vertical Horizons Treehouse Paradise is another treehouse B&B featuring four treehouses. 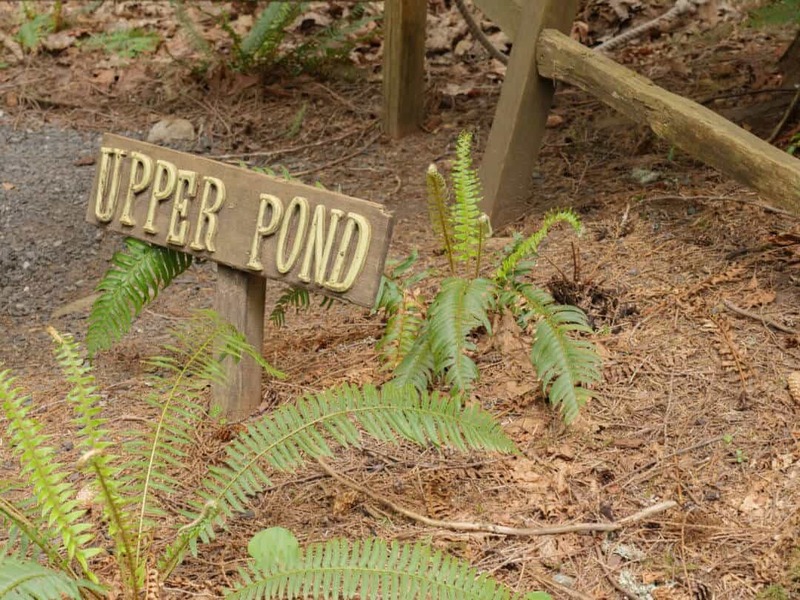 They feature disc golf, catch and release fishing (seasonal) and tree climbing. Treehouses rent from $280 per night for two people in Calypso up to $760 per night for six people in the Excalifur suite. Vertical Horizons is located in Cave Junction, OR. Location is given out at time of booking. The Bluebird House is located on the Oregon Coast in Gold Beach, OR and houses up to four guests. 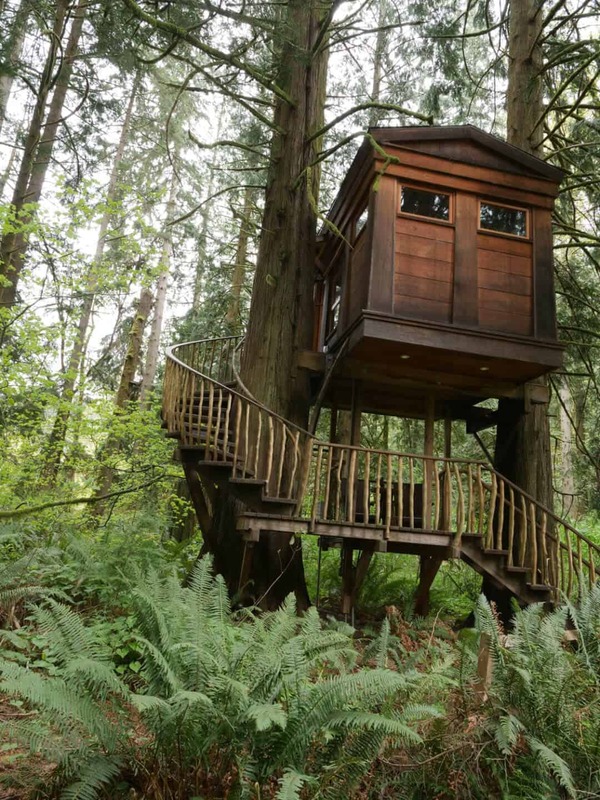 While I’m not sure this one is actually built in the trees, it’s at least elevated, and classified as a treehouse by AirBNB. One unique aspect of this property is that the owner has miniature donkeys. 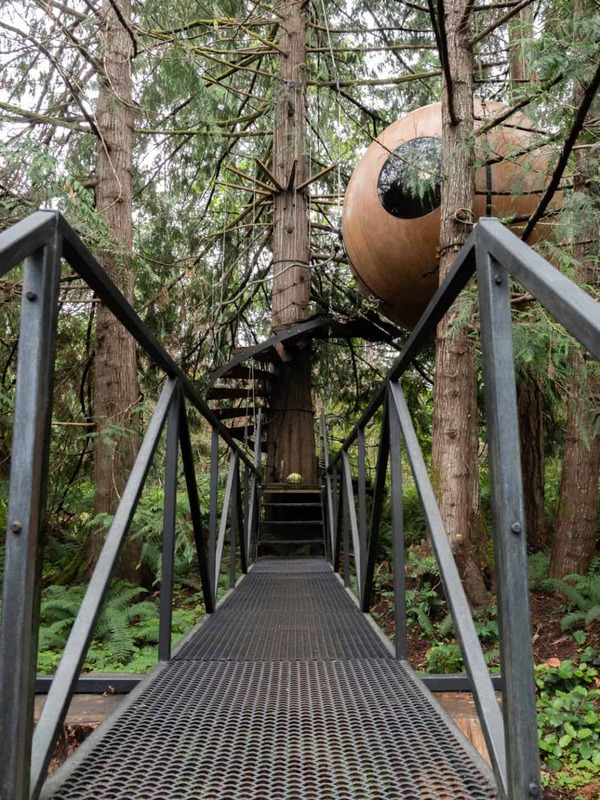 This treehouse rents for $145 per night on AirBNB. As it’s an AirBNB exact location is only available on booking, but it’s located in Gold Beach. 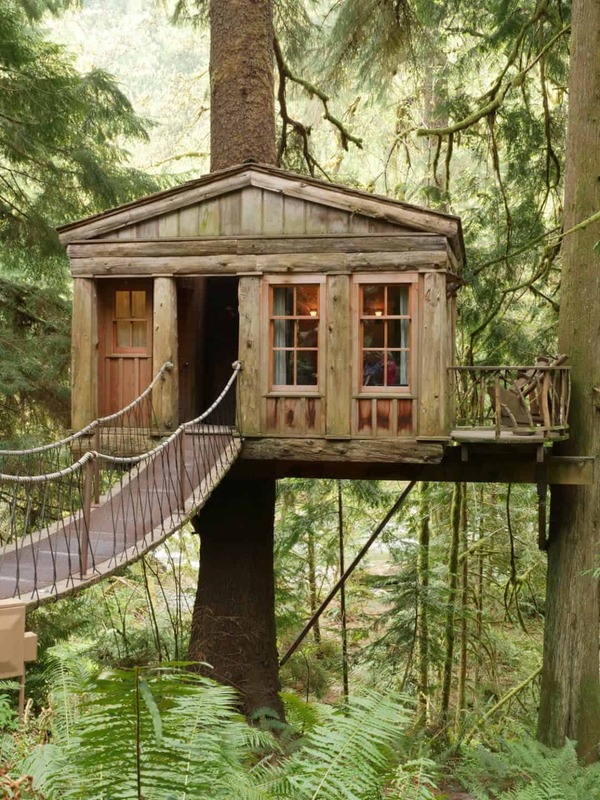 This treehouse rents for $140 per night on AirBNB. 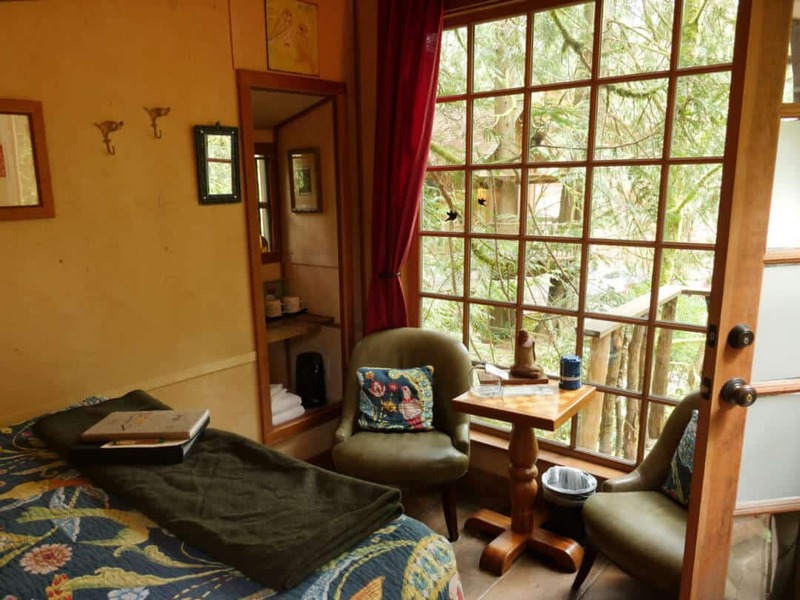 As it’s an AirBNB exact location is only available on booking, but it looks like it’s located near Sandy, OR. OK, next time I go to Idaho, I’m staying here. This treehouse and the property look lovely. It’s right on the lake and there appear to be kayaks, so I’m in. 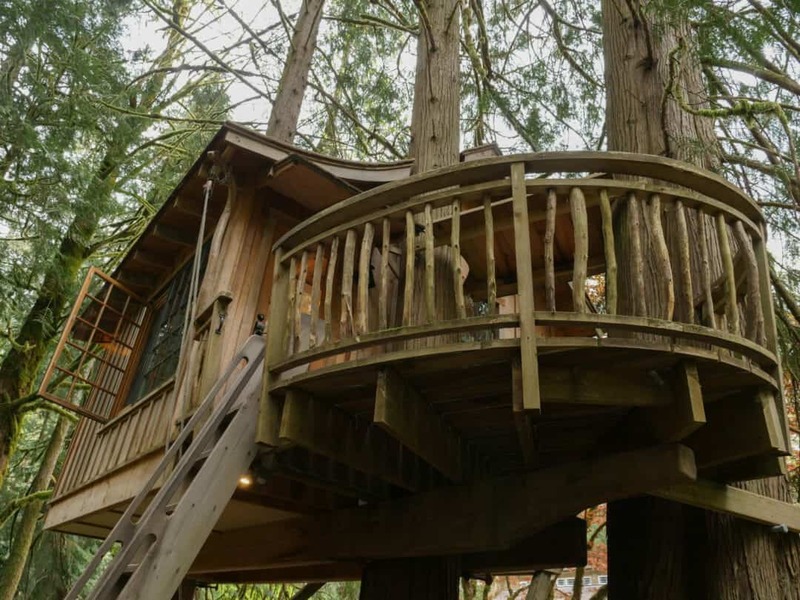 This treehouse rents for $195 per night on AirBNB. As it’s an AirBNB exact location is only available on booking. It’s located in Sandpoint, ID on Lake Pend O’reille. This would be a great snowy getaway. 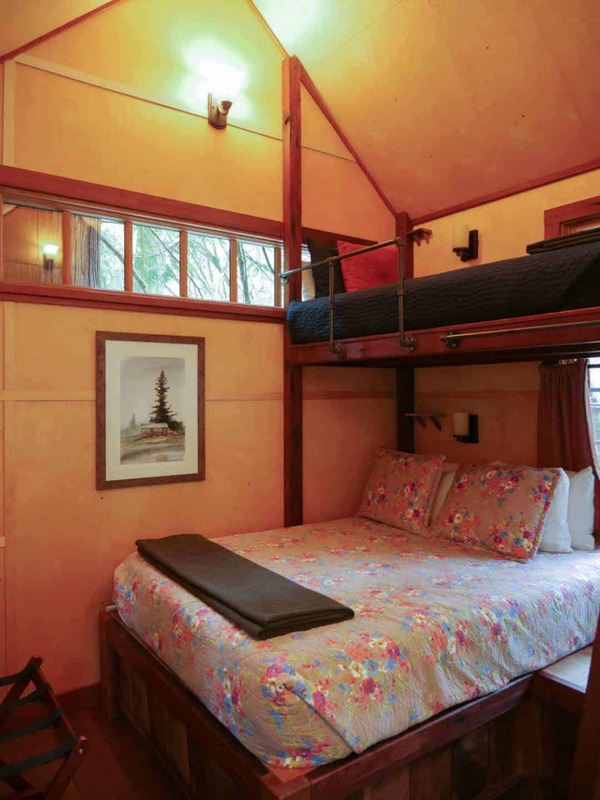 The 13 acres of woodland allows for snowshoeing and it looks like you’re met in town by the caretaker and transported up to the lookout in a revamped 1960s Thiokol Snowcat. 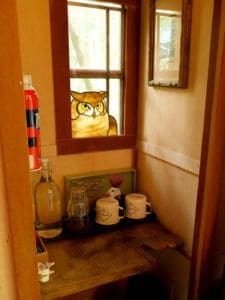 The lookout is another property of small-home enthusiast Kristie Wolfe who created the Hobbit house in Orondo, WA I mentioned in this post. 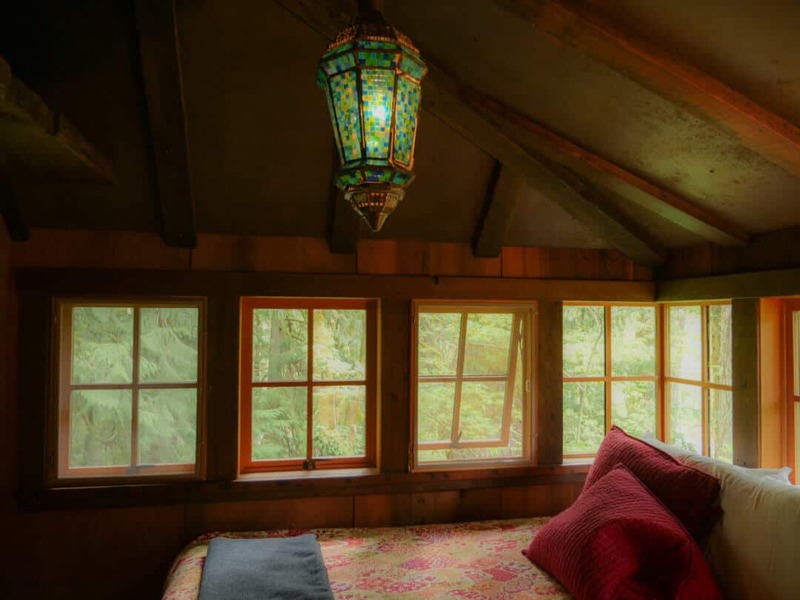 This treehouse rents for around $180 per night on AirBNB. As it’s an AirBNB exact location is only available on booking. 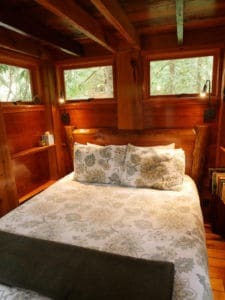 Not many photos here, but this looks to be a cozy 12′ x 14′ treehouse. 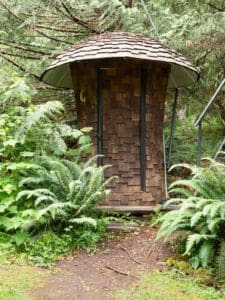 And, the owner points out, like many real treehouses the bathrooms are outside of the main treehouse. 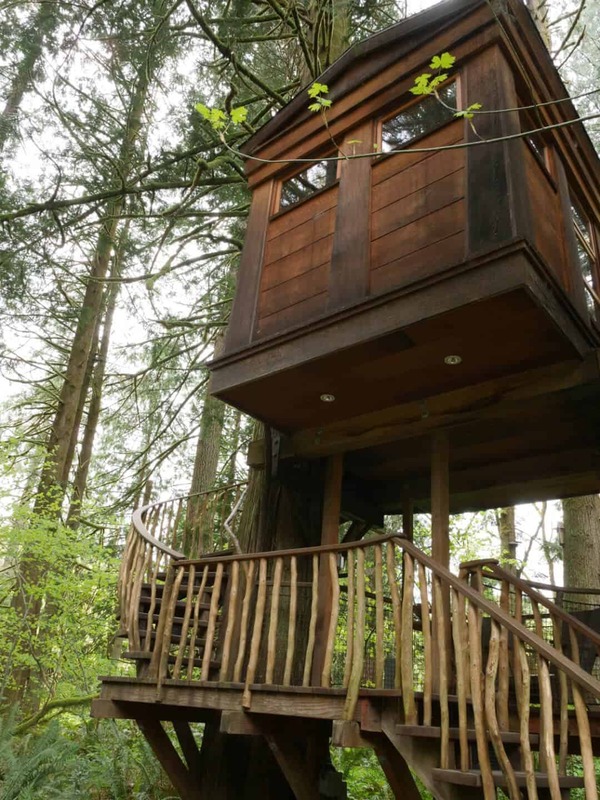 This treehouse rents for $175 per night on AirBNB. As it’s an AirBNB exact location is only available on booking. It’s located in Coeur d’Alene. Salt Spring Island is located off Vancouver Island in BC. This one looks like it has a deck with amazing sunset views over the water. Max two guests. 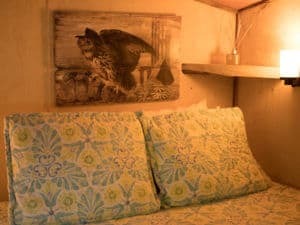 At a current $86 per night, this is more affordable than some of the treehouse destinations. 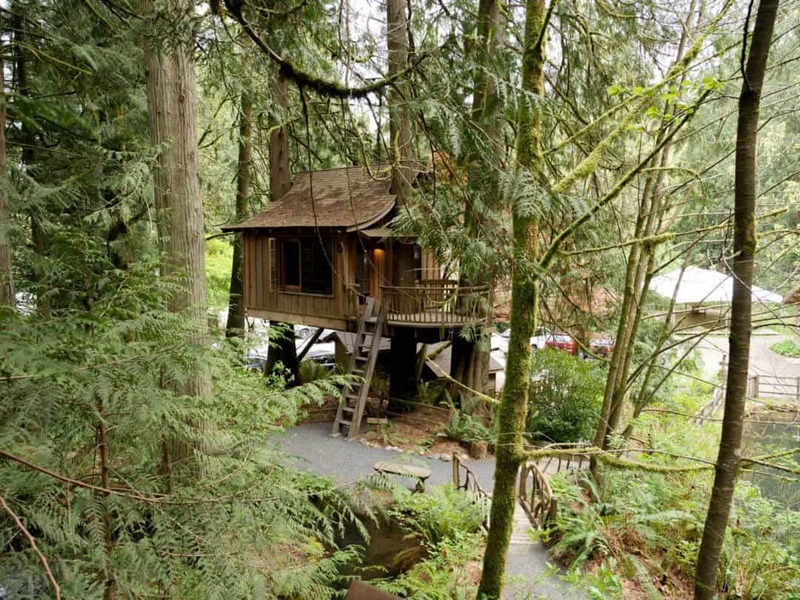 This treehouse rents from AirBNB for $86 per night. 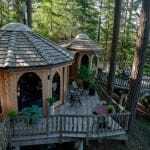 It’s in Salt Spring Island, BC, on the west side of he island but, because it’s a private retreat, address is available upon booking. 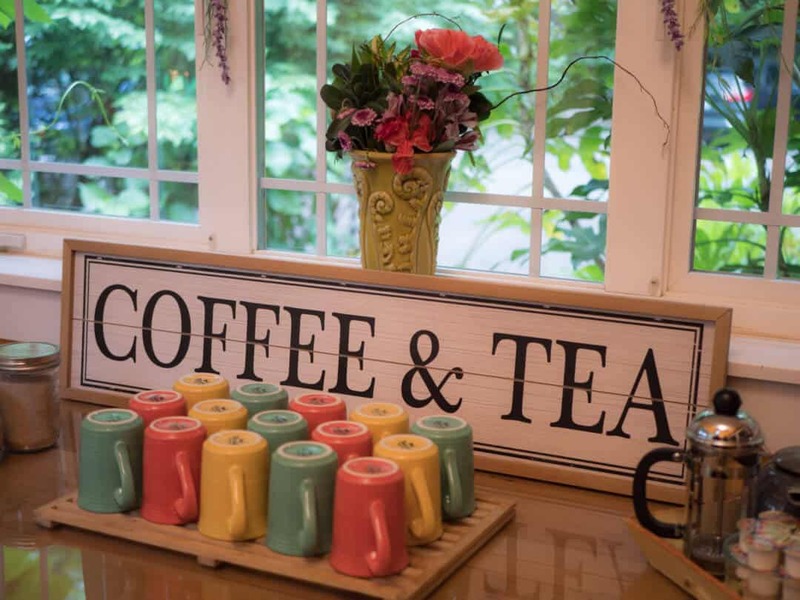 Secret Cove offers a cozy cottage or suites with prices ranging from $199 for either in the off season up to $538 per night for up to four guests in both the cottage and suite during the height of summer. During summer months, they also have a canoe available, in case you feel like paddling on the bay.